This helps to keep matters in one area and I am trying hard to avoid AOL which is not very good anymore! This past week has seen some changes in fleets and a Midlands Interlude from Dylan Jones. I'm adding a new section on Correspondence as I feel it gives more exposure to the writers. I have become fascinated with the Bustimes.org site as I find I can even see what's going on in the Isle of Man and the Isle of Wight but most annoyingly nothing on Stagecoach in Oxfordshire!!! I also notice it hasn't reached Eire yet but has reached Belfast. 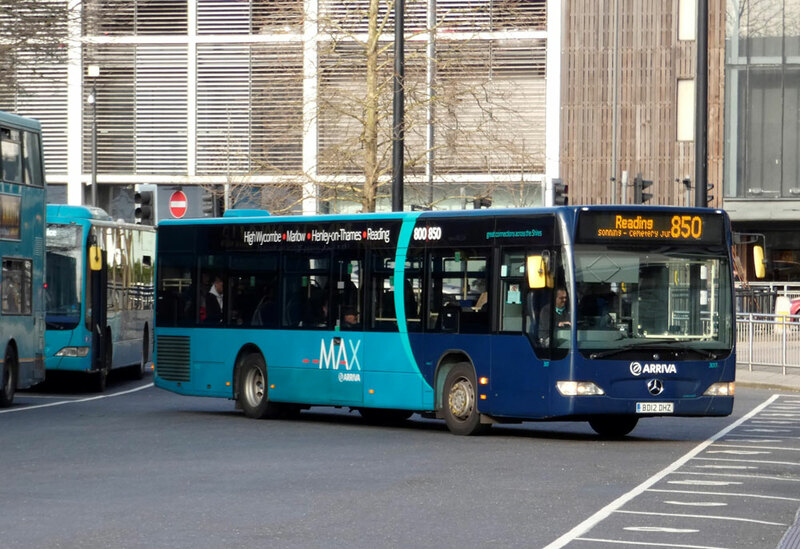 I think it is great because one can see if one's bus is on the way or not but operators not included are missing out on a very useful tool in their Marketing efforts. The weather has improved during the last few days and we are having nice sunny days instead of rain and cold. This of course makes life easier for the photographers amongst us. No further news is available regarding Reading's acquisition of Courtney but I am sure this is only around the corner? Many of you may have known Ralph Adams who had been a very knowledgeable figure in our enthusiast hobby for many years. Ralph passed away at his residence in Berinsfield last Tuesday evening, March 19th. He often rode an elderly bicycle around Oxford when working for the City Council. Those of you who benefited from his regular news e-mails will doubtless have been surprised at the amount of information he gleaned from many sources which generally turned out to be correct. 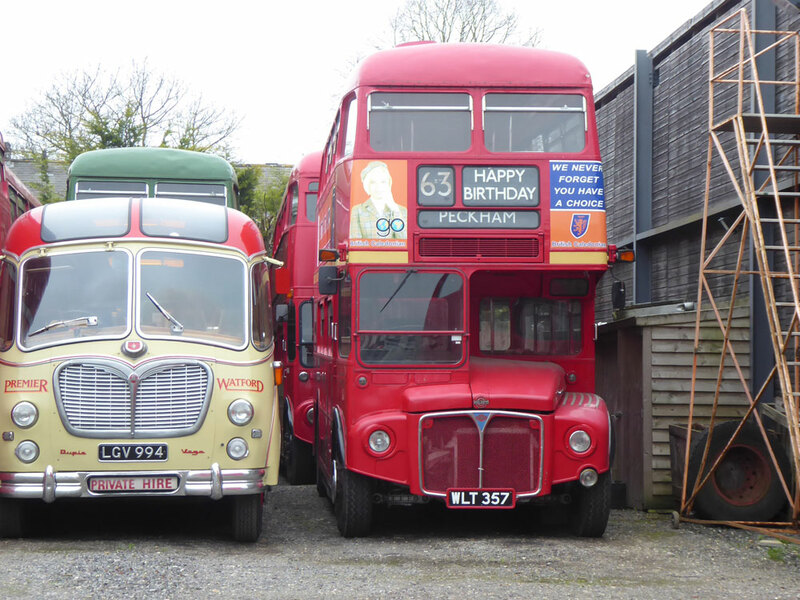 Graham Low reminds me that Ralph was a founder member of The Oxford Bus Enthusiast Society and never missed a meeting! I think his last major project was to record the move of Thames Travel from Wallingford to Didcot only a few weekends ago. He and I enjoyed several long telephone conversations when he was always most amicable and ready to help solve my questions. 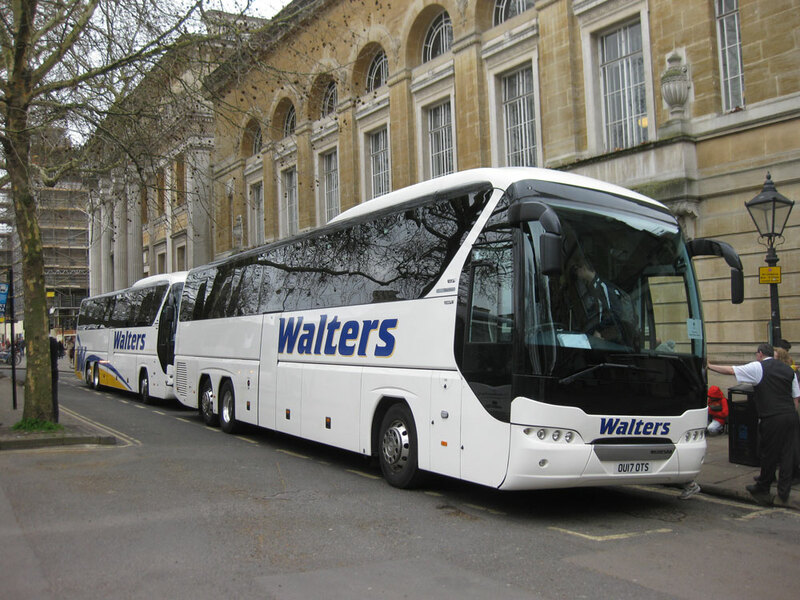 More recently he had been able to provide pictures of his activities and most recently noted that a lot had been happening to the rear destination screens on the Citaros and sometime ago around Christmas he went to Bicester Village to record the Park & Ride services which for a few weeks included Stagecoach vehicles from Oxford. The earliest days I recall were his Sunday visits to the Stagecoach depot, always made on his trusty bicycle complete with the small tool bag attached to the saddle, always a feature of those older machines! Ralph will be missed by a number of enthusiasts for his knowledge and useful bits of information. From Peter Brown who writes "I am a long time reader of your OCBP but unfortunately not had anything to contribute for a long time (probably 10+ years!) as most the local news I learn myself from reading your page! 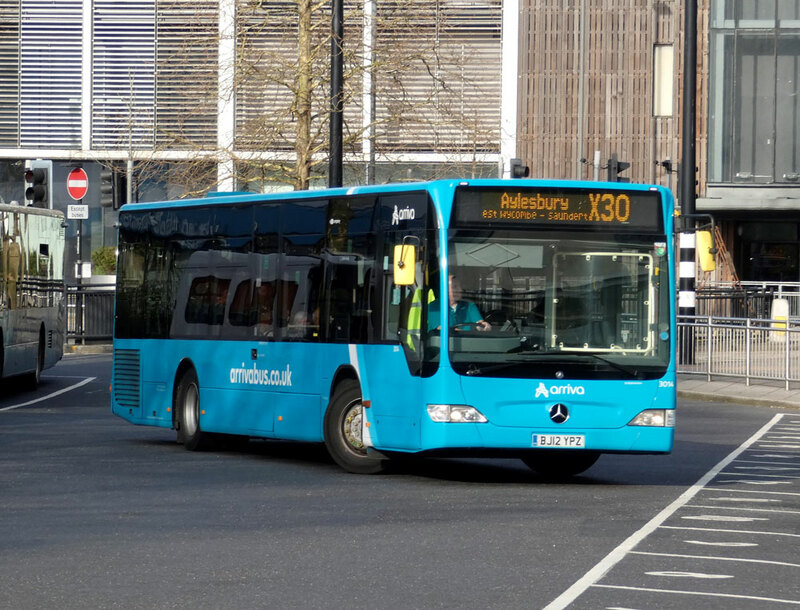 However, today I might finally have something to contribute which I don’t think has been mentioned yet but Red Line in Aylesbury look to have acquired at least four ADL Enviro 400’s which look to have formally been with a TfL operator. Unfortunately the only details I could quickly get was that three were 55 plates and one was an 06 plate. I have attached a picture I took this afternoon of one in their yard on gatehouse way and there were three more parked against the fence at the back of the yard." 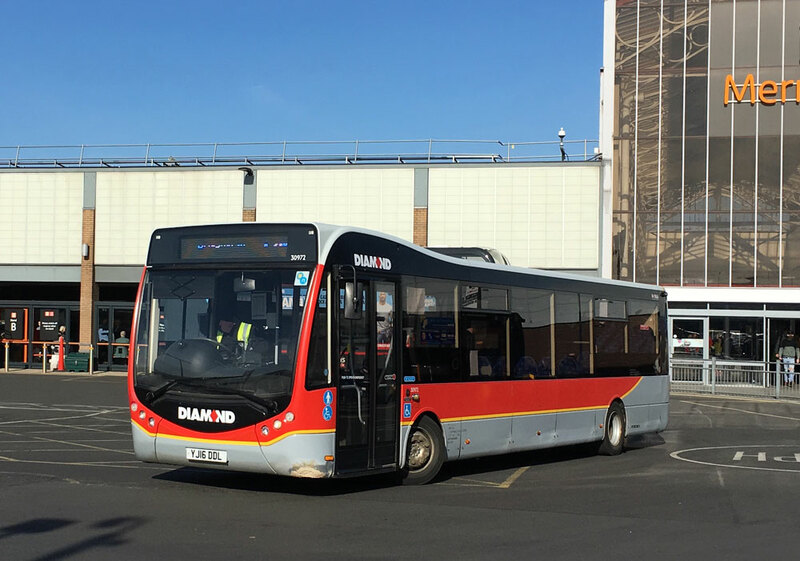 "The picture was taken in the Red Line only yard on the industrial estate in Aylesbury, I’ve not noticed any Enviro 400’s at the yard they share with Red Rose at Dinton but will keep my eyes peeled!" Some more from Paul and a note that last week's Lodekka stated as in Newbury, "boohoo" Guys, it was Bracknell! Mike Walker wrote: "Probably not the first to point this out but Paul’s shot of 634 on the 52 isn’t in Newbury. 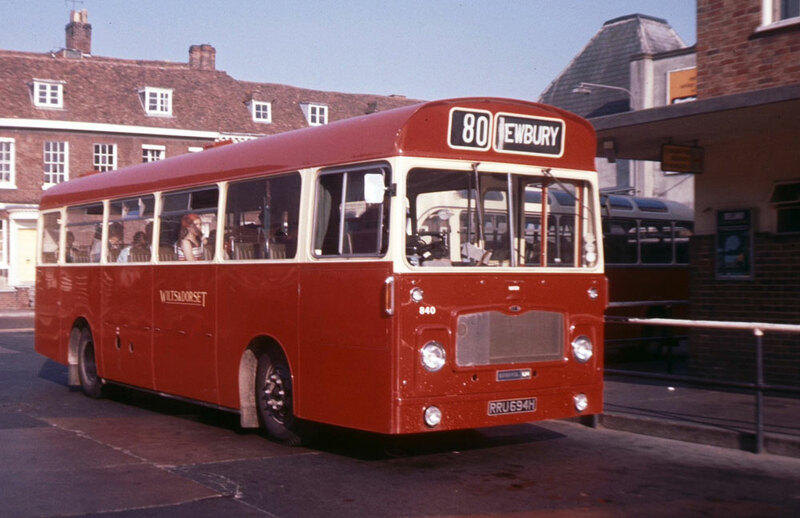 The 52 was a Bracknell local service, most Newbury routes were in the 1xx series as they were largely inherited from the real Newbury & District. 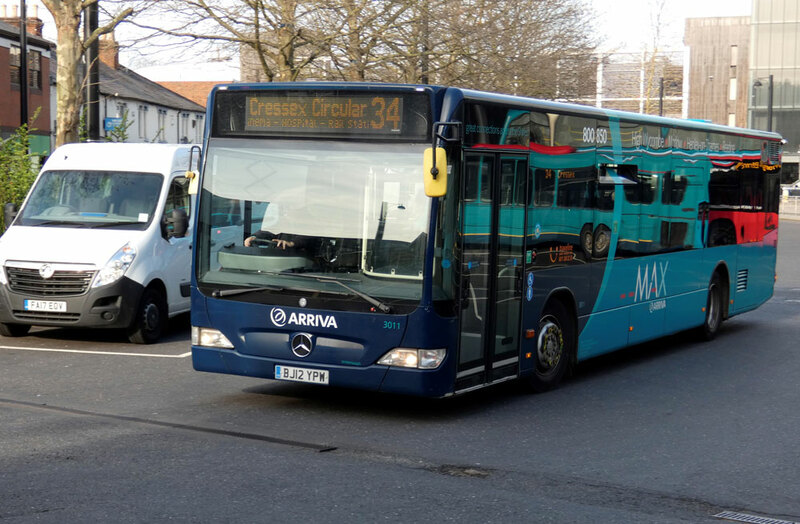 Good to see 196 at Marlow, typical TV – less than a month in service and already looking tired and showing signs of a fuel overfill which was common, how many gallons of diesel went down the drain in TV garages over the years I dread to think." Thanks to Mike Walker for that correction and thoughts on 196. Berks-Bucks 604 F175LBL at Bracknell working the 159 on May 7th 1993. 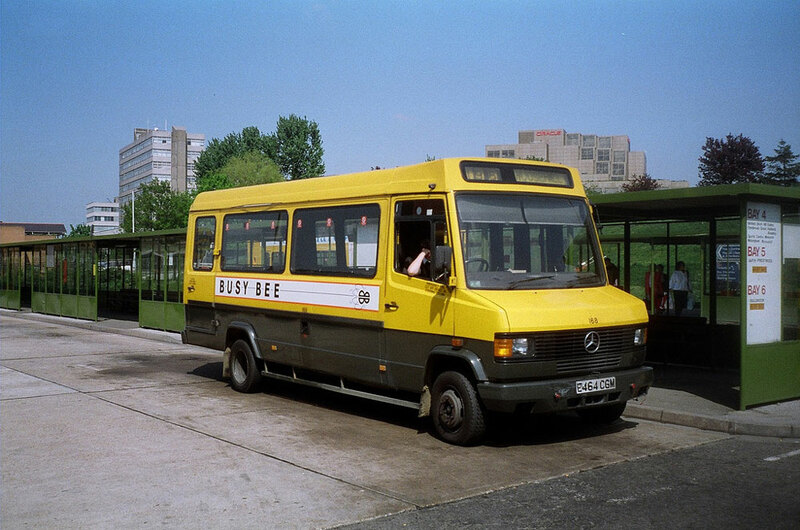 Berks-Bucks "Busy Bee" 168 E464CGM in Bracknell Bus Station on May 7th 1993. Chiltern Queens ex Aldershot & District SOU440 in Reading on the B service to Wallingford on October 29th 1974. 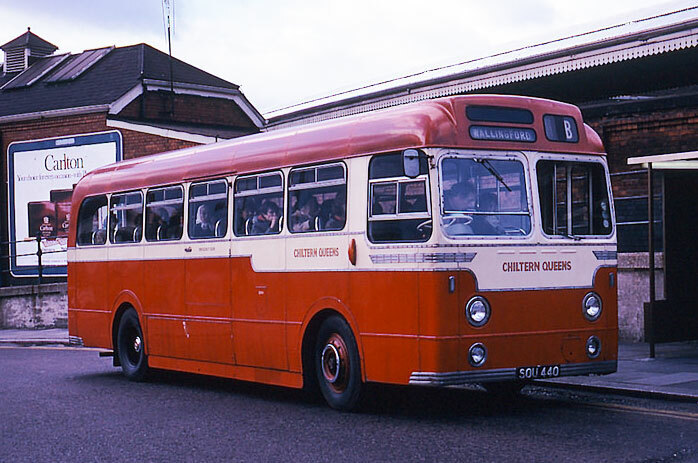 Chiltern Queens YNX478 an AEC with a body from a Dennis seen on the Didcot service in Reading-Reading. The date October 29th 1974. 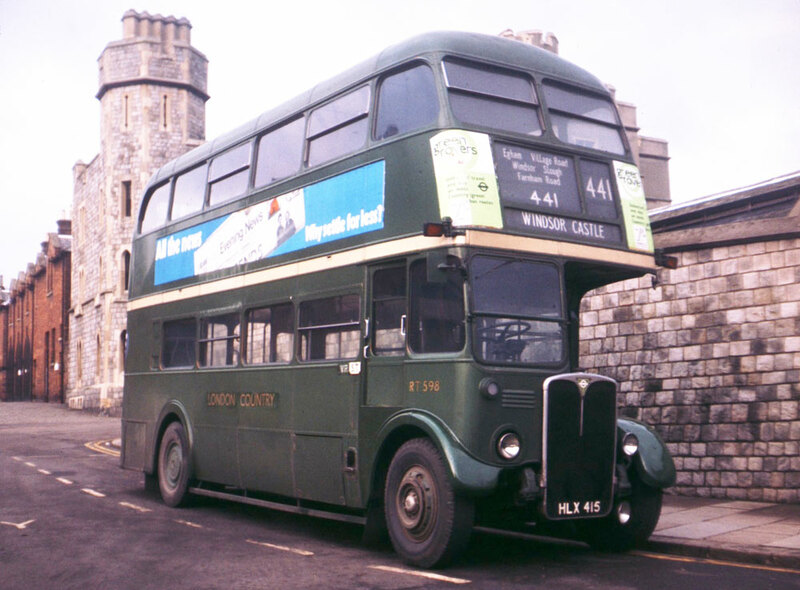 A lovely picture of RT598 working the 441, which ran to High Wycombe, seen on January 28th 1970. The bus looks in need of a coat of paint. 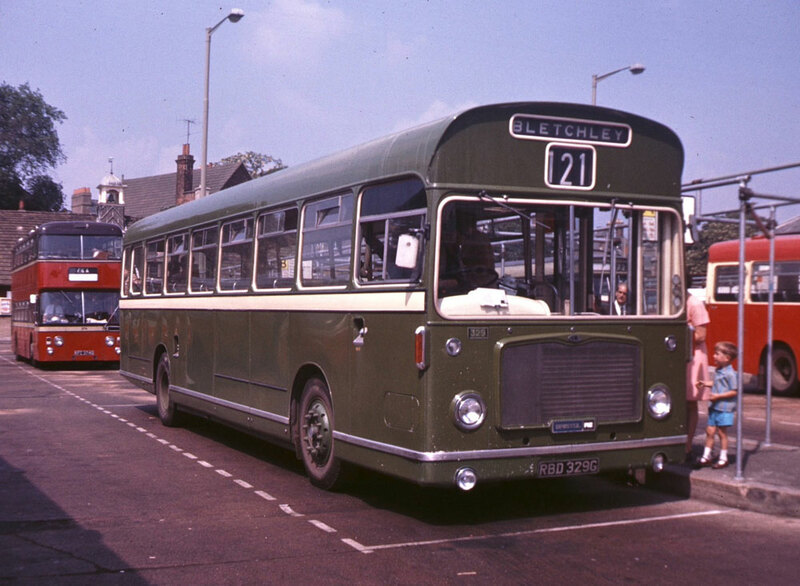 An AEC Reliance with Burlingham bodywork, Reading's 249 running to STATIONS, a typical Reading destination seen on July 8th 1970. United Counties 329 RBD329G with a 121 service to Bletchley on June 8th 1970. I wonder if the young man waiting to board was an enthusiast? A rather pristine Bristol LH, 840, RRU694H belonging to Wilts & Dorset is heading for Newbury with service 80 on June 6th 1970. Please be aware these pictures from Paul Bateson are Copyright. 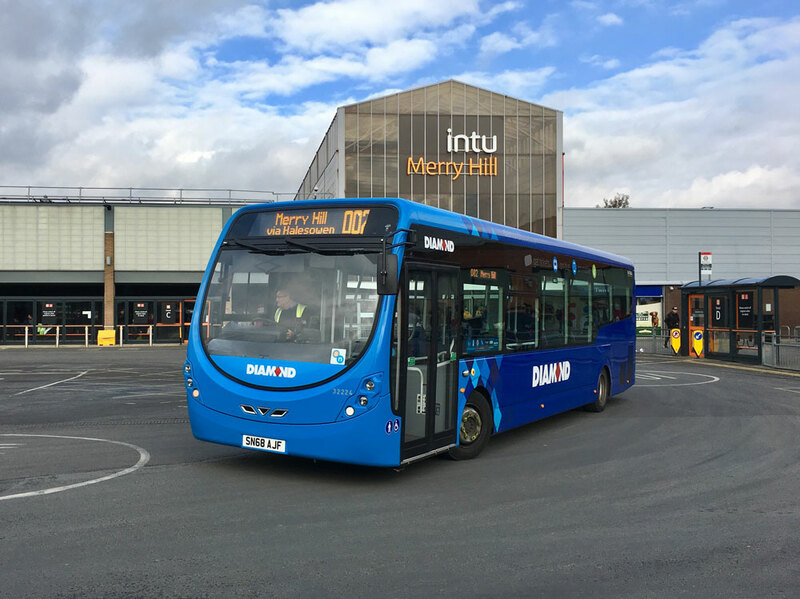 Dylan has provided readers with an update from the smaller operators and First's Citaros in use in the Midlands area. First up, is First Midlands ! 64021 and most of its sisters have had slightly local connections in Slough and High Wycombe when with Beeline. 64021 and 64042-5 carry this purple based branding for the Nimrod 35 from Worcester to Blackpole, where 64021 is pictured. This is the only 2004 build one based here. Showing off more of 64021s branding, here it is meeting with 64018 in Warndon. 64018 being one of 6 from Southampton and originally London. 64012-6/8 are the ones allocated here, and all see use on most of the Worcester routes, though not the full 144 to Birmingham, as they are only Euro 2 or 3! 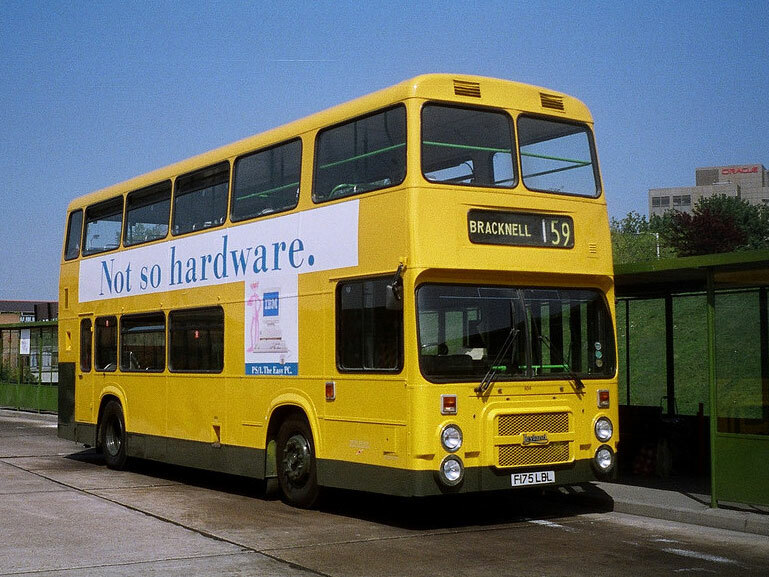 Showing its Spare Bus livery to good effect in the recent sunshine, 64035 is one of two that carry this livery, which is like Transdev's Pride of the North, 64033 being the other. This is pictured on Northfield High Street, with the Salt Road 144 to Worcester. These two are regular on the weekday 144, though see little use on weekends from my observations ! Parked up at Crowngate Bus Station here are 33403 and 33043. Both have been based here for a number of years now, 33403 being one of 5 new to Midland Red, though originally to now defunct Redditch. 33043 has since been withdrawn, and was new to First Capital. They were pictured in between runs on the Rugby Special Service. Two former Midland Red routes at Droitwich here: 144 from Worcester to Birmingham (which once continued to Malvern Well) and 145 now just Droitwich to Longbridge, though once a through service to Birmingham. 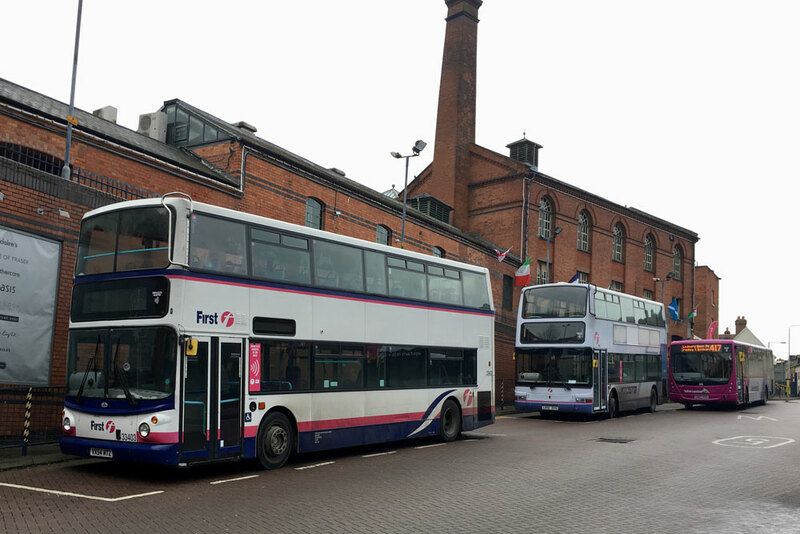 Pictured are Igo Metrocity YJ68FTO and First Midlands 69436. 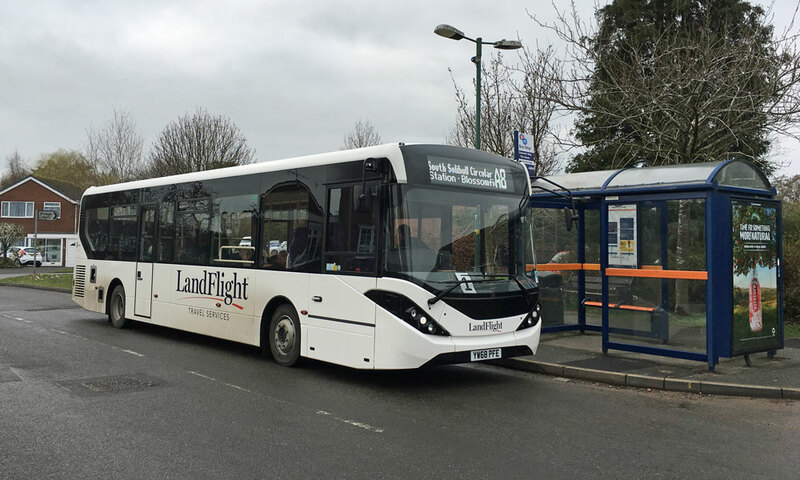 Recently on loan to Igo has been ADL Enviro 200 MMC demonstrator YX18KWV. 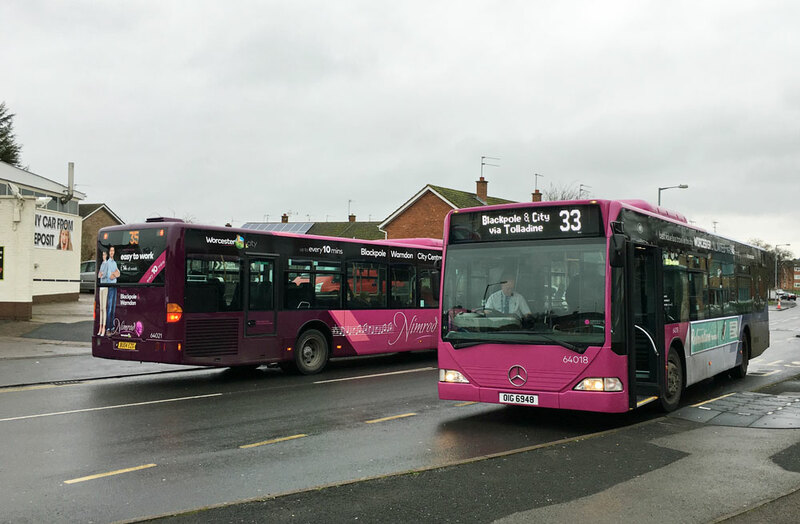 It is pictured here in Northfield, with a 39A to South Woodgate. 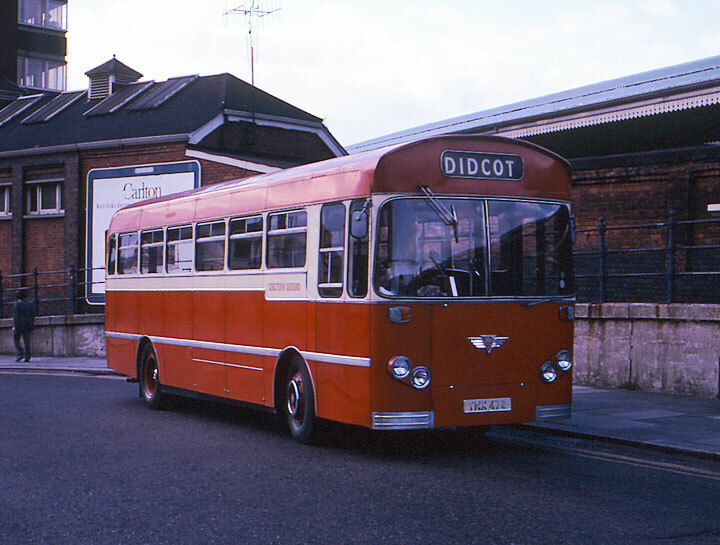 Igo only had it in service for 4 days, before it moved on to Yeoman's Travel in Hereford, and later a few Welsh operators. A big development for Rotala owned Diamond is the introduction of a large batch of new StreetLites. The allocations to Tividale, Redditch and Kidderminster are not quite set in stone yet, but Kidderminster should get 3 eventually for the 125, Redditch a batch for the 50, and Tividale a batch for the 002, with appearances on the 4 occasionally. This is 32224 at Merry Hill Centre, with a 002 from Weoley Castle. 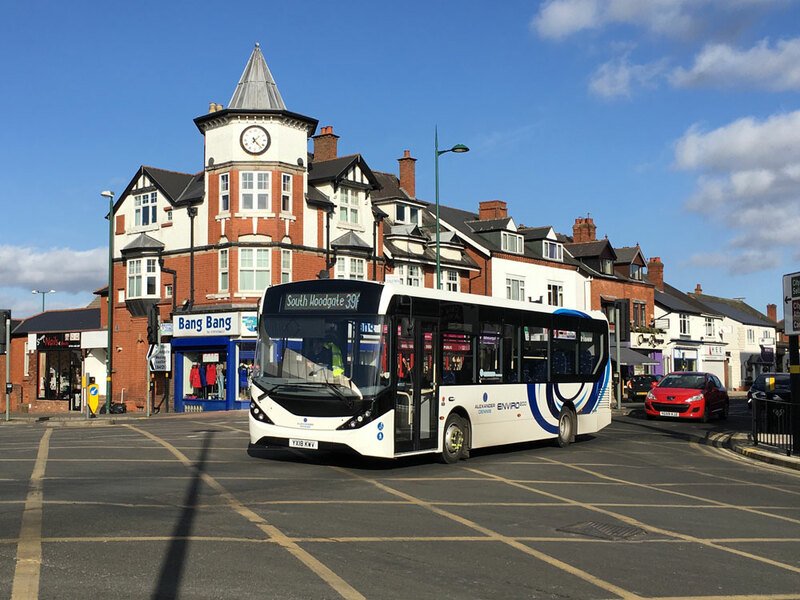 The other main development in the West Midlands are the Solihull Route Changes, bringing new fleets of MMC200s to the former Diamond Signature Network. 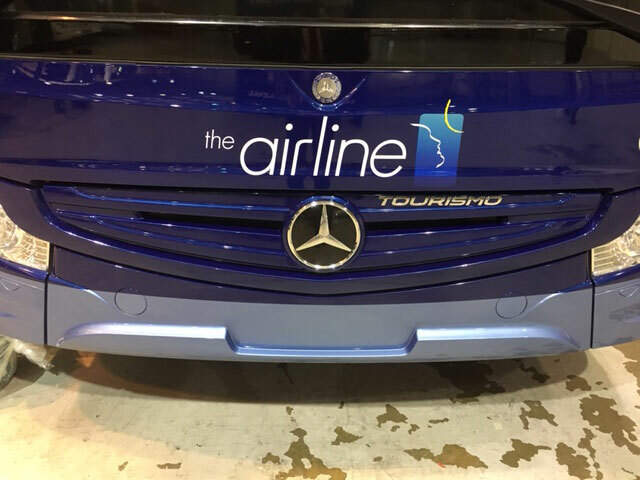 Before they entered service, I paid a visit to the Silverline Landflight depot in Solihull, to get some pre service photos, and these what I believe to be the only ones with the MMCs carrying ADL badges, as they have since been removed on the front for logo application. This is YW68PFJ and PFF at the depot - readers may have seen these photos already, as I did post them on Flickr, and some Facebook pages used them. 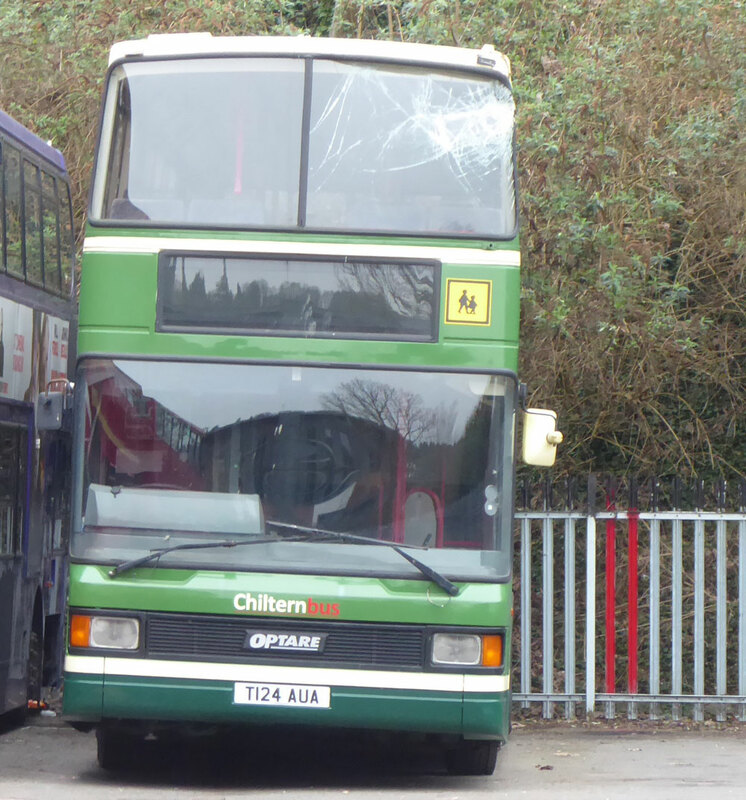 Flash forward a few weeks and here is YW68PFE in Cheswick Green, with the A8 South Solihull Circular. 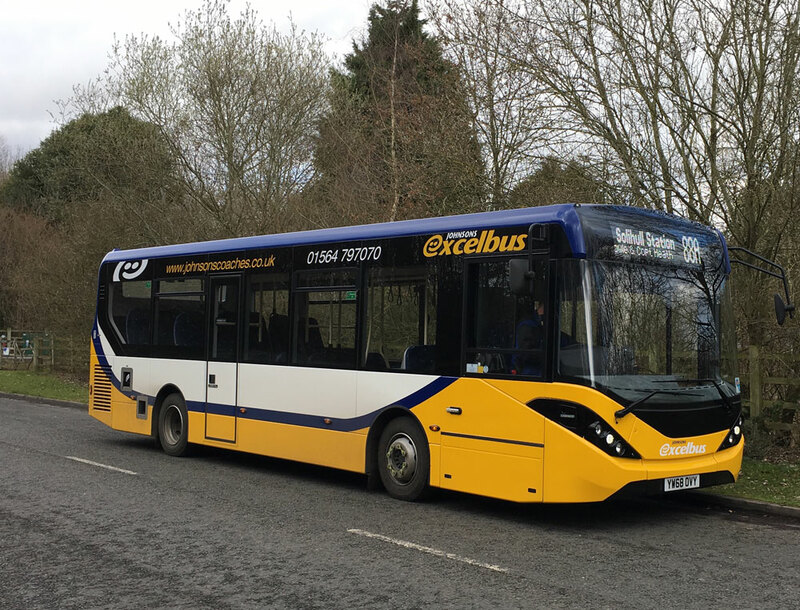 seven new MMC200s have joined their existing one to operate routes A3-8. 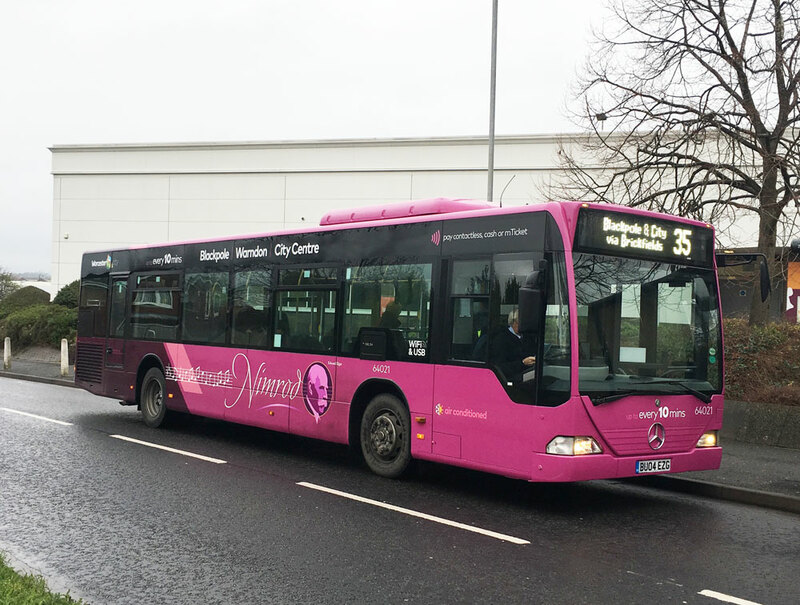 Johnsons YW68OVY is one of three new MMC200s with the Warwickshire based firm, for use on their new routes 82/88/A, as well as the existing 87. All of these operate towards Coventry, though the 88/A terminate at Balsall Common, near Berkswell Station. Also new at Johnsons are three older shaped E200s. 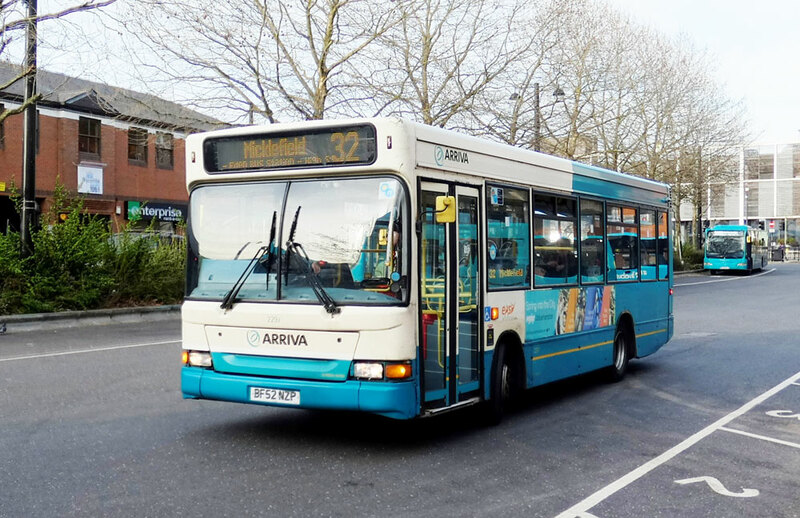 Diamond 21219 is one of their ever growing number of Mellor Minibuses, this one being one of three allocated to Redditch. Diamond only won routes A1/2, which require one bus through interworking. 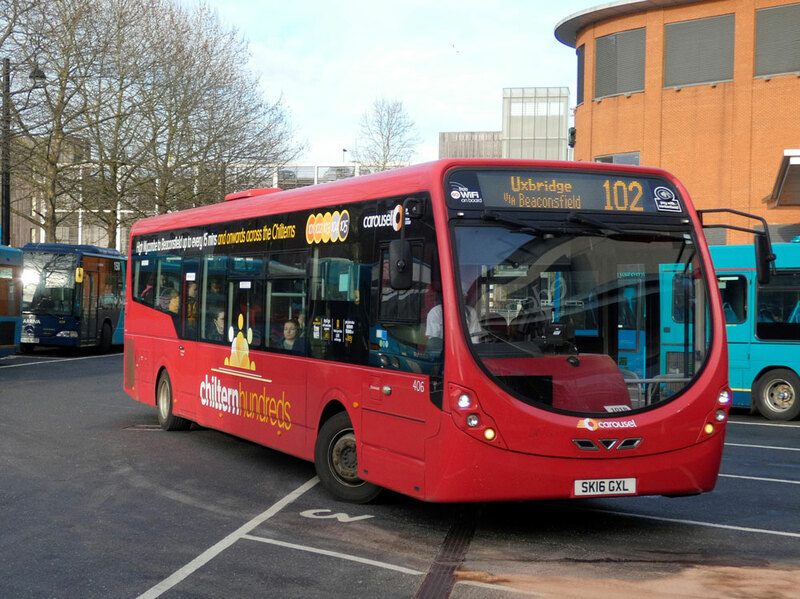 Redditch also operate one on the 42 in Coventry, plus there is a spare. Diamond hadn’t done too much to the ex Central Buses Fleet after a year of acquiring them in February; 30972 was pictured at Merry Hill on the 250 Circular, though these 3 Optares are now in the process of gaining the ‘a new brighter diamond’ livery. More is promised by Dylan and this time it will be on West Midlands. 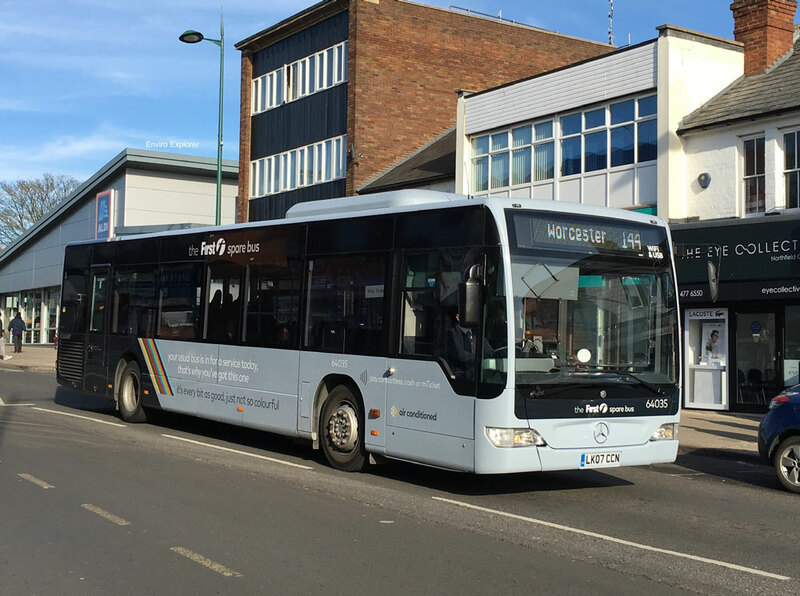 An interesting anomaly in the fleet at High Wycombe is that one Citaro carries two fleet numbers, the old and the new on the nearside and rear! Front and offside is grand. I have been trying to catch this particular bus in my lens and it always appears either when I'm not ready or when there are others buses in the way! Anyway here's what I managed on Saturday last. I was also able to take a few pictures whilst in Wycombe which I hope readers will appreciate? 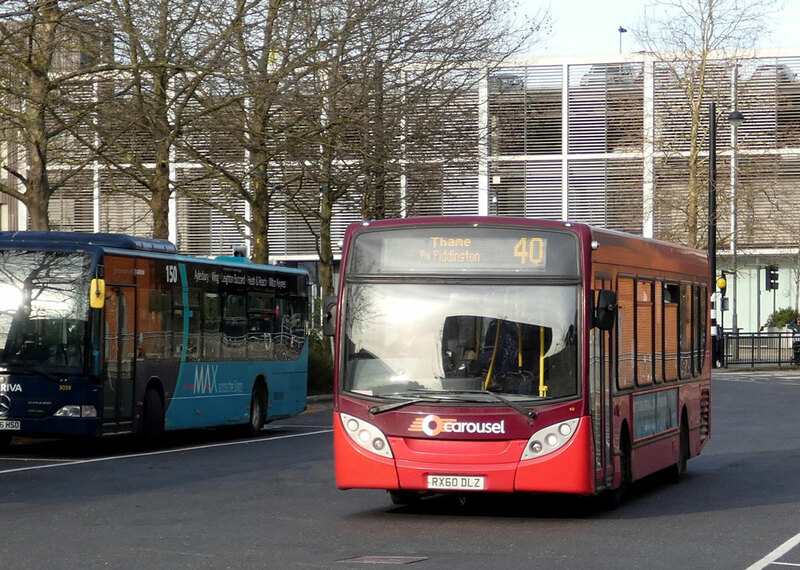 Small Darts in Wycombe, 2159 and 2297 leave the Eden Bus Station on March 23rd. 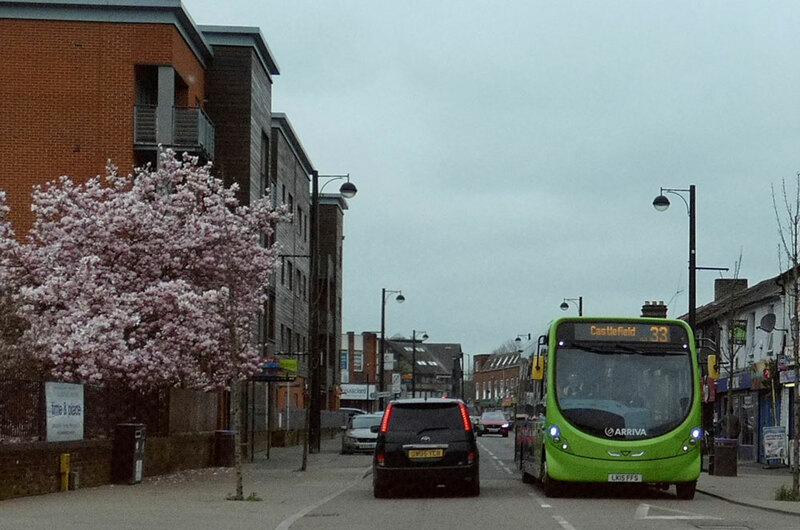 Spring blossom and a StreetLite 2318 on the 33 share the picture on March 23rd. Citaros in a variety of liveries, 3011, 3014 and 3017 in the Eden Bus Station on March 23rd. 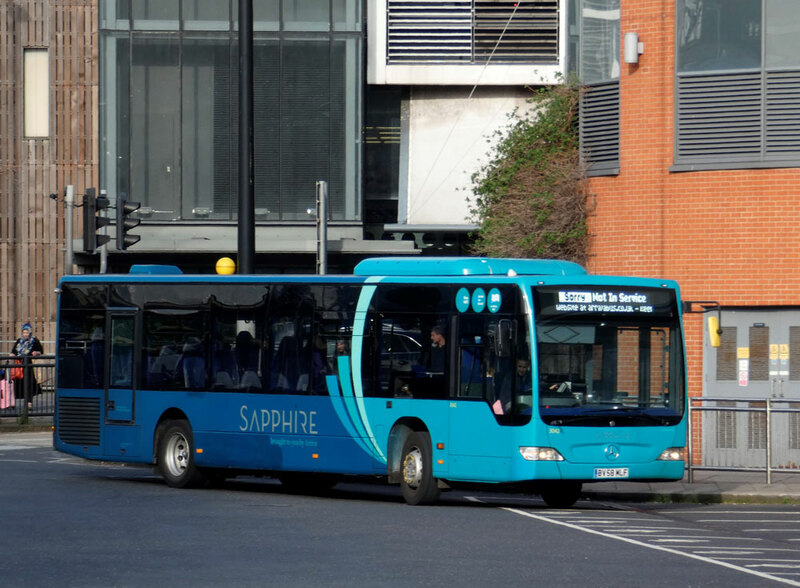 Citaro 3042 bearing what appears to be a repaint but still in Sapphire livery on March 23rd. 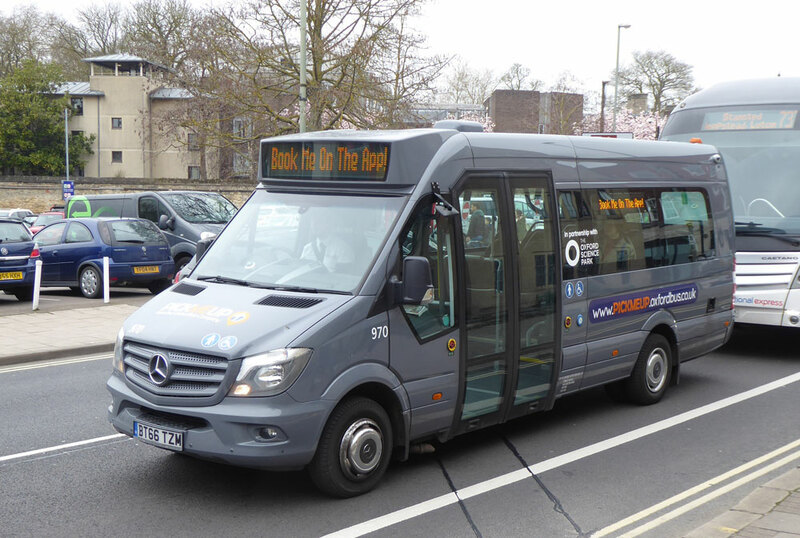 Citaro 3925 works the 1A to Chesham Pond Park on March 23rd. 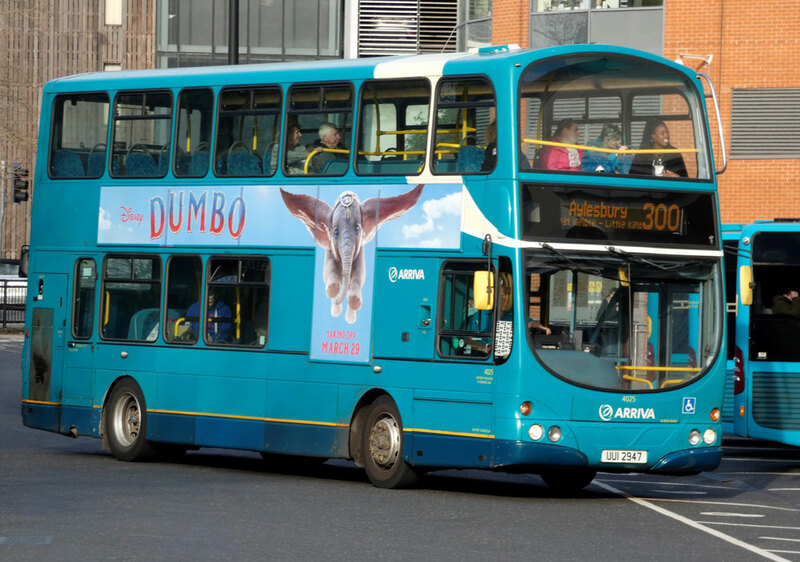 Wrights 4025 is seen leaving The Eden Bus Station with a 300 service to Aylesbury on March 23rd. 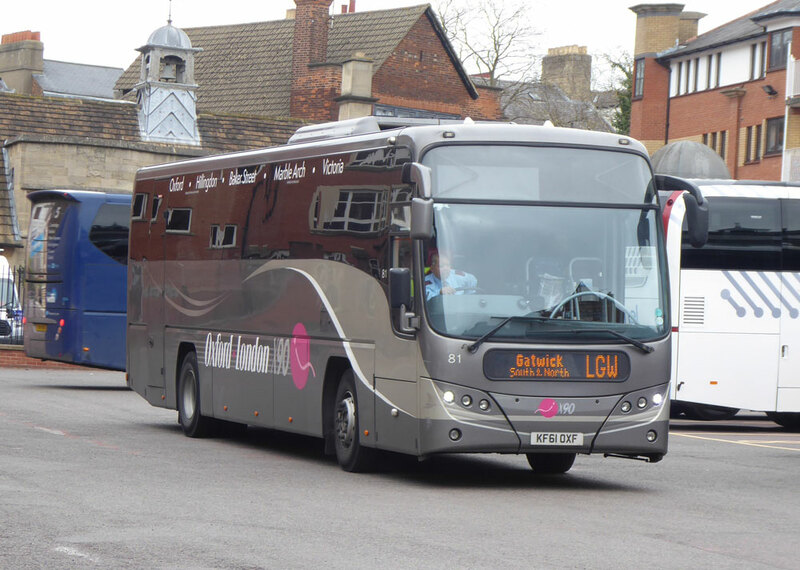 Van Hool 4376, still in use by Hemel Hempstead, is seen with a 758 service on March 20th by Gavin Francis. 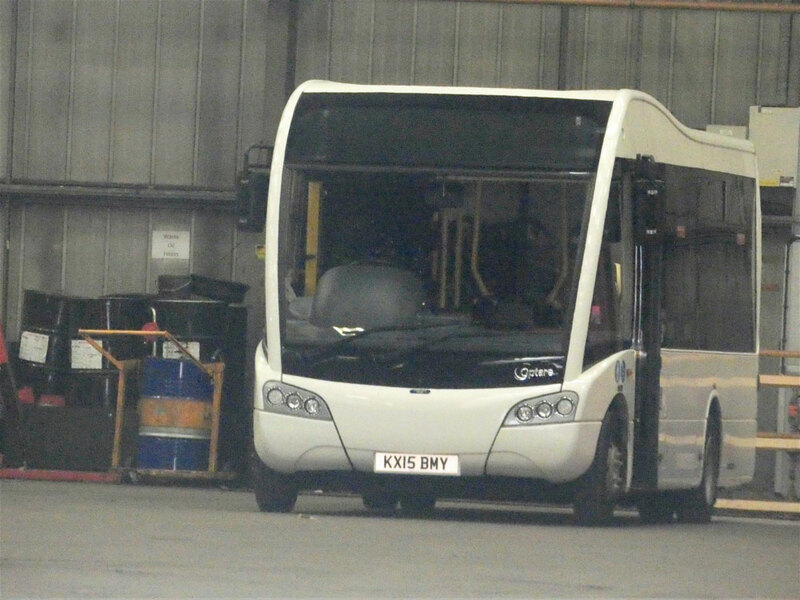 Optare T124AUA seen in Carousels overflow yard on March 22nd by Gavin Francis. It seems that the problems with the acquired M A N/E200 fleet continue as certainly 424 is still off the road with engine problems However last Saturday, as my picture below shows 423 was back on the road but working on a local route, to make sure all was well with a rebuilt engine, working the 39 its old route and the reason it was painted orange along with 424. The 40 this last week had some variety but was mainly worked by 420 and 421. 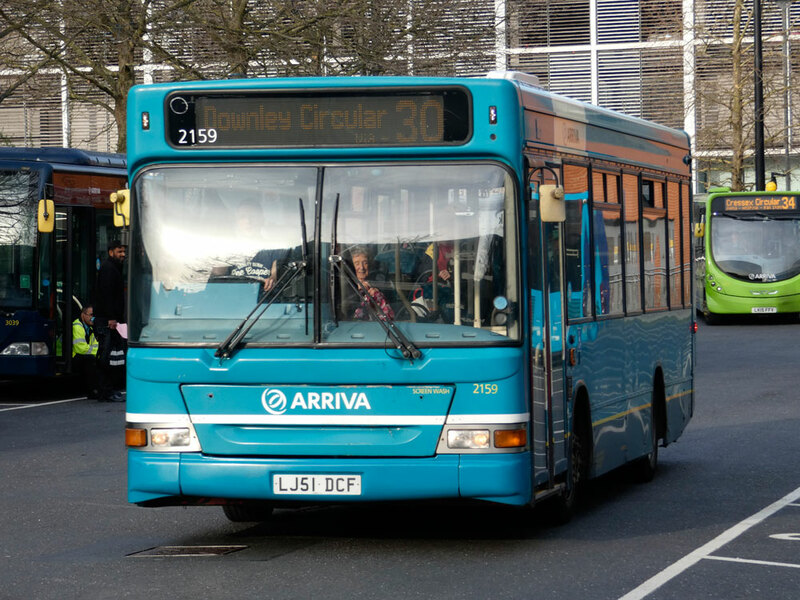 However as I write this week's page on Sunday I see 423 is back on the 40, well done Carousel. 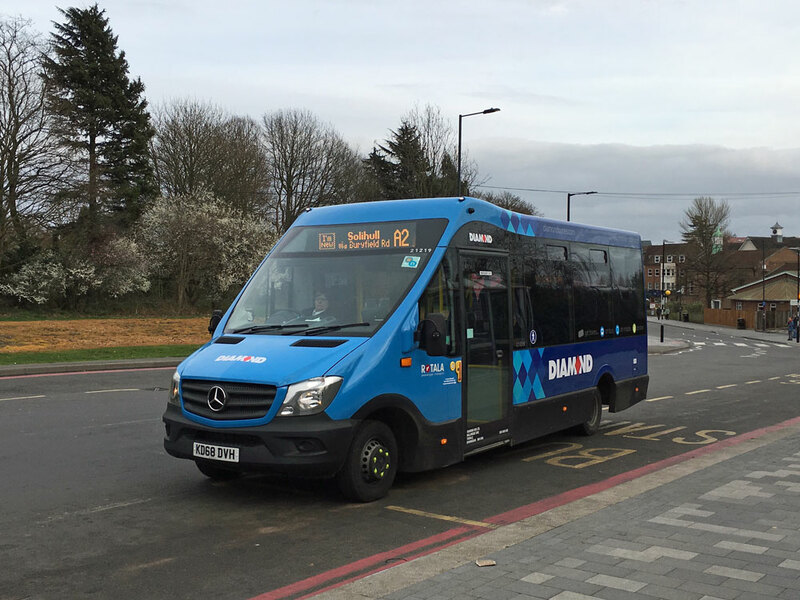 One "scoop" this week was of Bucks County branded E200, 502, working the 40 and which I got a nice picture of a the bottom of New Road in Stokenchurch. 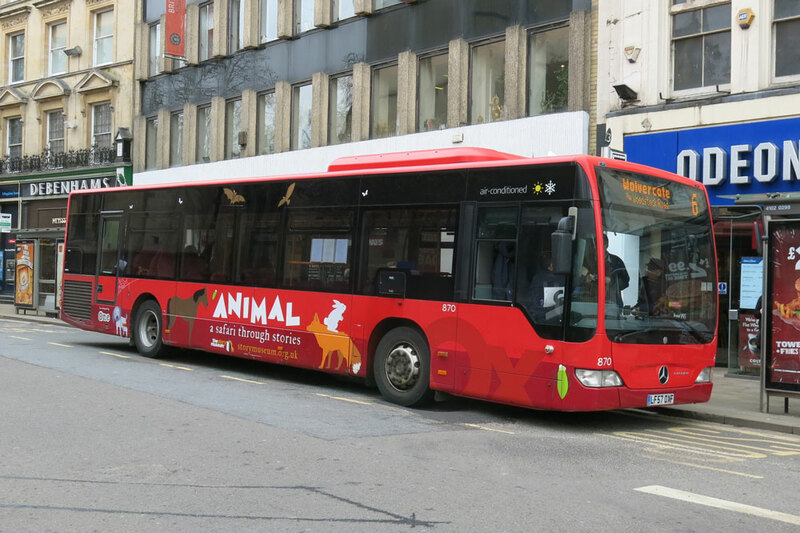 I was alerted to this bus on the route by referring to the web site mentioned last week https://bustimes.org.uk/vehicles. Passing by the depot I was able to secure a picture of the SOLO SR allocated to work a contract service. I have not seen it on staff transport in the last week but maybe I was not around when it did? Also I am advised that the Solo is only on loan and will be going shortly when 976 is returned from Mercedes. It has been away having its gearbox replaced. The change of 976 is still to be confirmed. 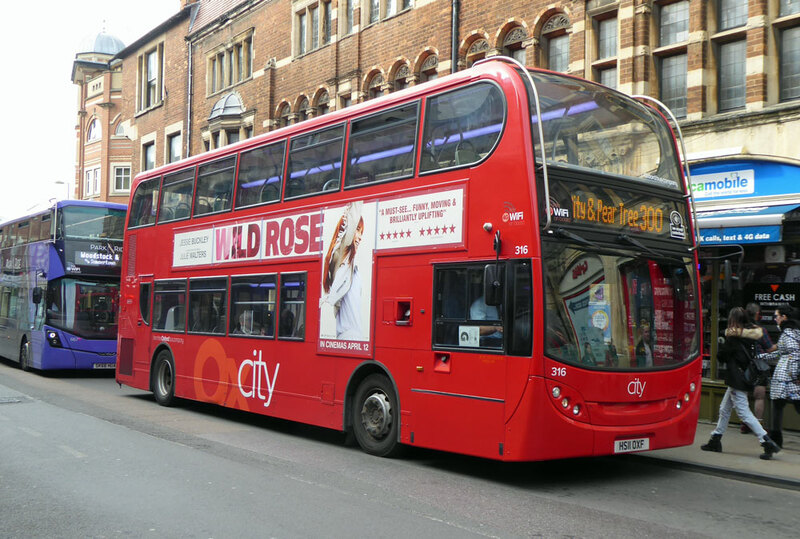 Phil Southall writes to advise that 938 (ex GAL LONDON WDL1) is now in service at Carousel and 222 has moved back to Oxford Bus. 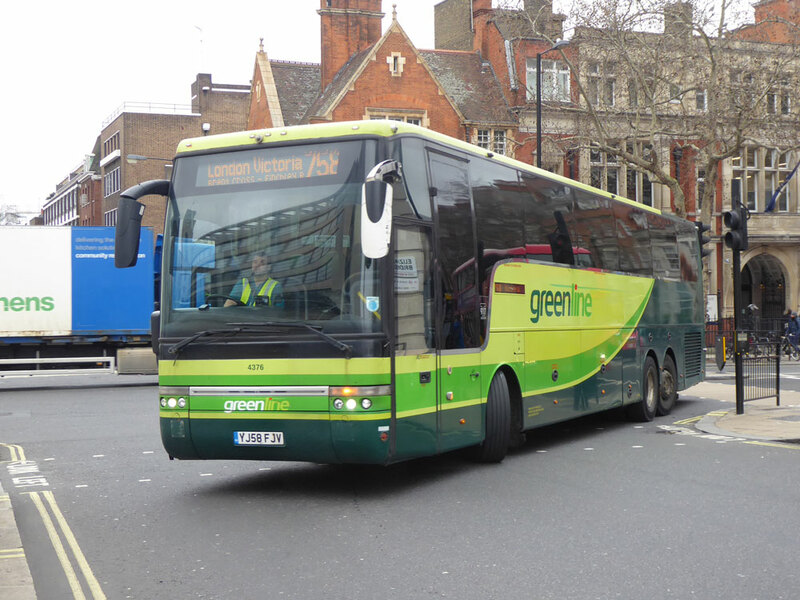 I do not have a picture of 938 but Gavin Francis provides a picture in Go Ahead London service. 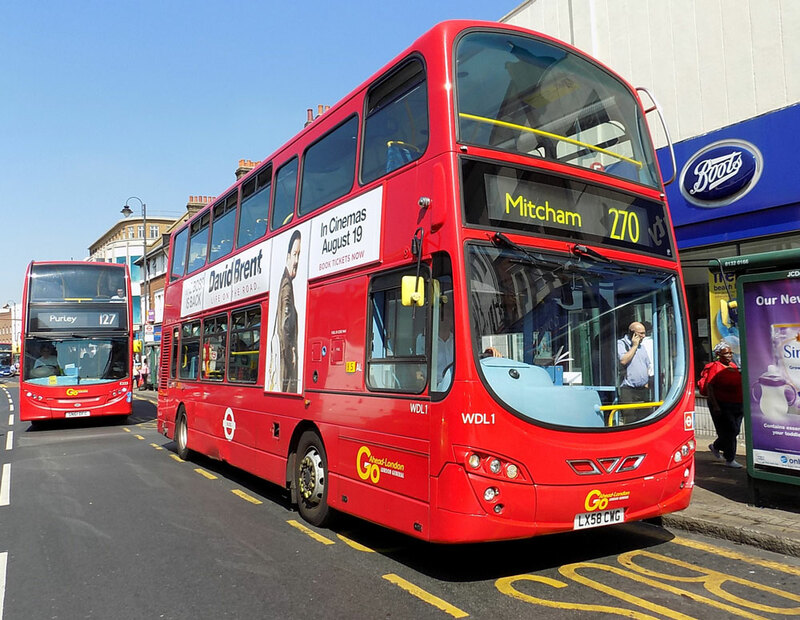 Go Ahead London WDL1 seen with a 270 in Tooting Broadway on August 17th 2016 by Gavin Francis. 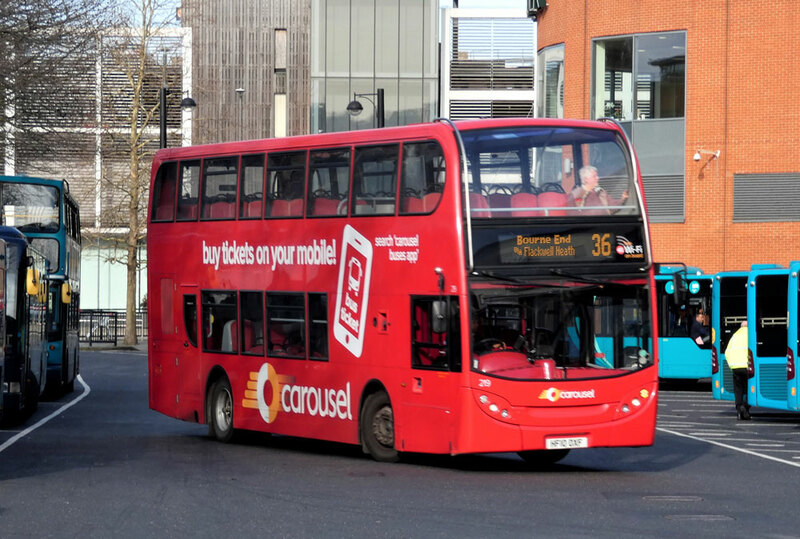 Carousel Scania 219 is seen with a 36 service to Bourne End on March 23rd. 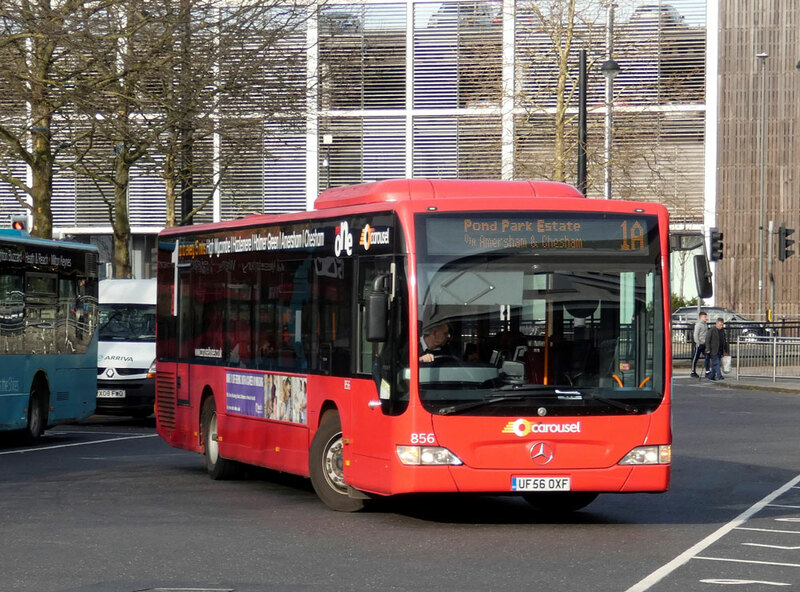 StreetLite 406 is seen departing for Uxbridge on March 23rd. M A N - E200 421 is seen leaving for Thame again on March 23rd. 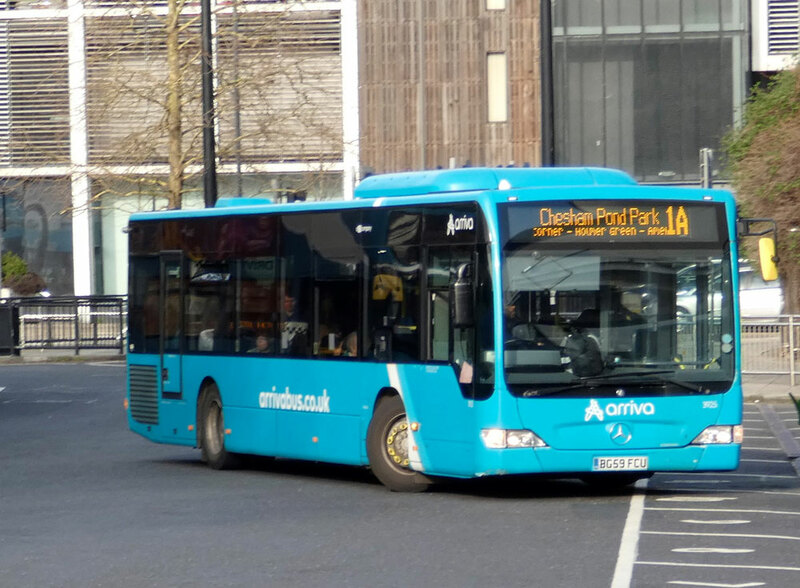 Citaro 856 is seen leaving with a 1A to Chesham Pond Park on March 23rd. 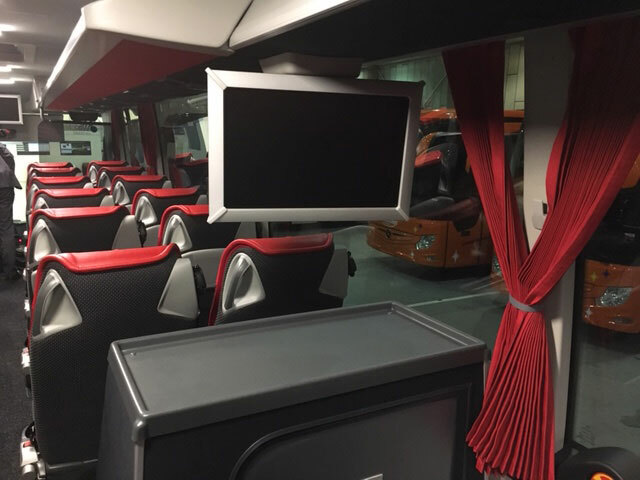 Having been to Evo at Coventry, Phil Southall advises that it will be a few weeks before the first of the new Airline coaches arrives but he has provided a few pictures as a taster of these vehicles. 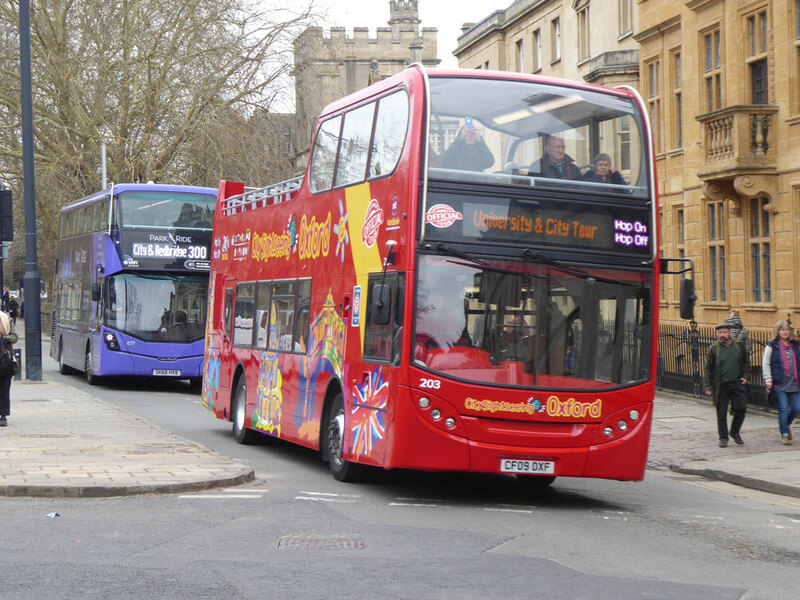 Pictures by Phil Southall, Oxford Bus. Graham Low writes "COMS 870 was on the 6 today- view attached." Derek Dawson writes "Not the best of pictures but thought I would sent his from the days of the social club railway spotting group." EBW109Y alongside Loch Ness date not recorded. 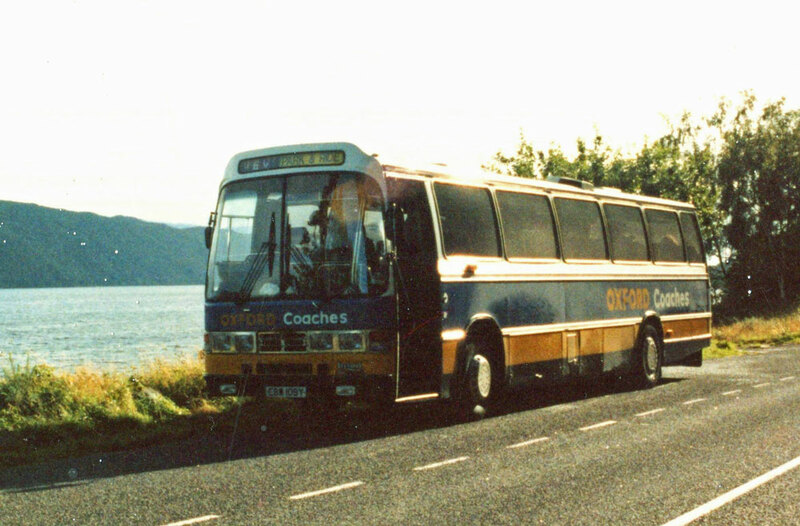 Coach 25 is generally used on SNAP services as seen above and has gained a new Super Rear. Seen on March 23rd by Gavin Francis. 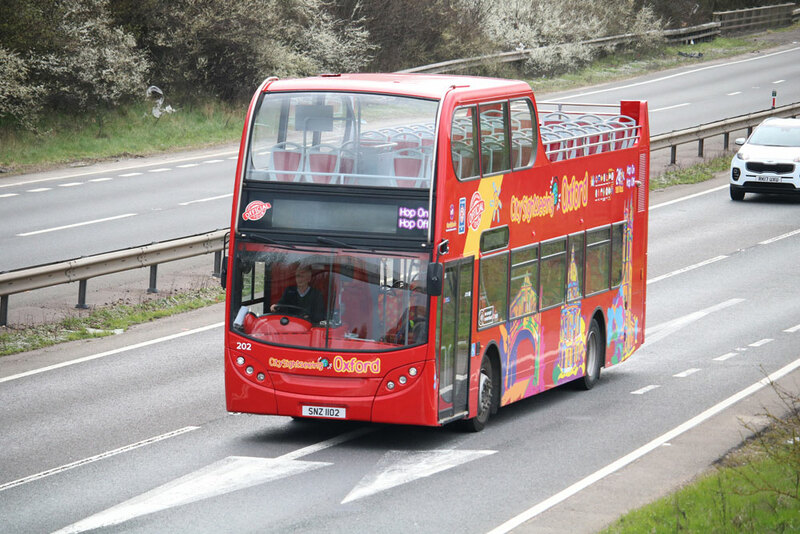 Oxford's 81 seen with an LGW working on March 20th by Gavin Francis. 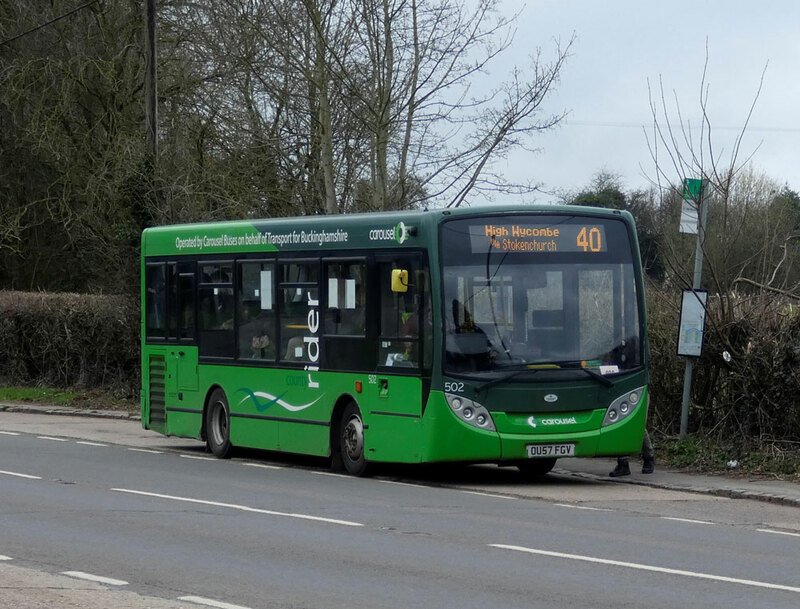 Hybrid 311 is seen working a 2A service to Kidlington on March 20th by Gavin Francis. 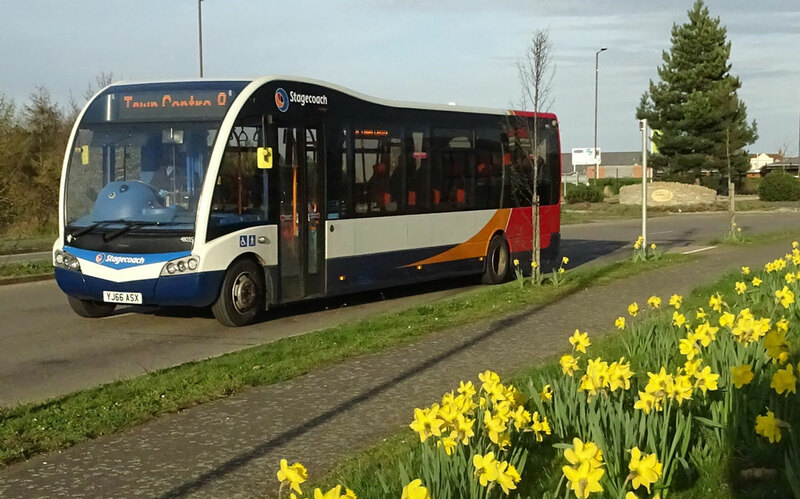 Hybrid 316 is seen with a Park & Ride 300 service on March 23rd by Gavin Francis. 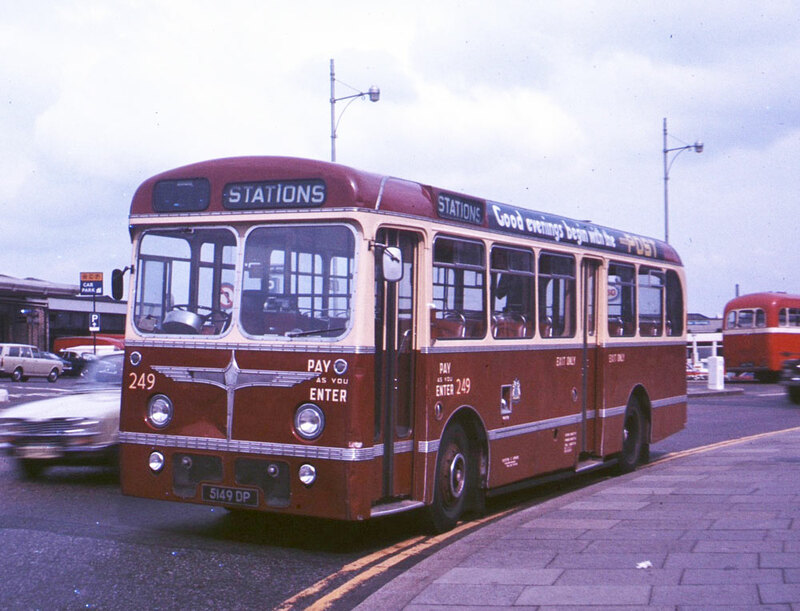 Wrights 660 at the Station with a 5 road service on March 24th by Gavin Francis. 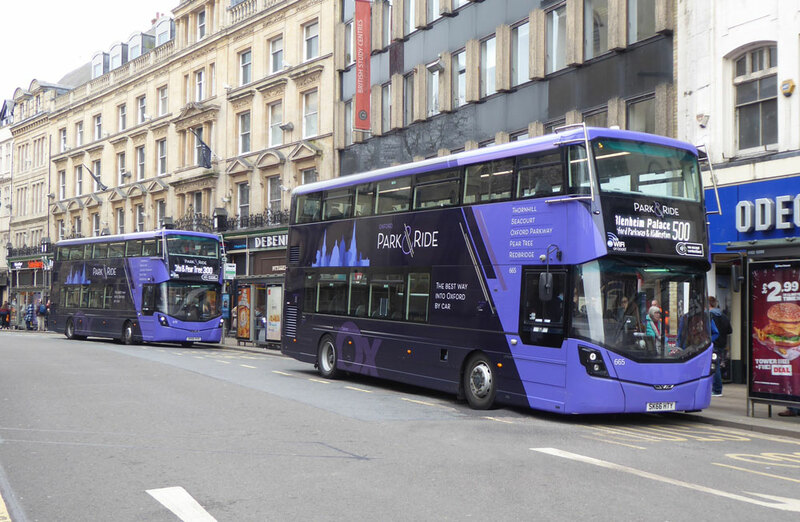 Park & Ride 665 works the 500 whilst bringing up the rear 679 with a 300 service on March 21st by Gavin Francis. 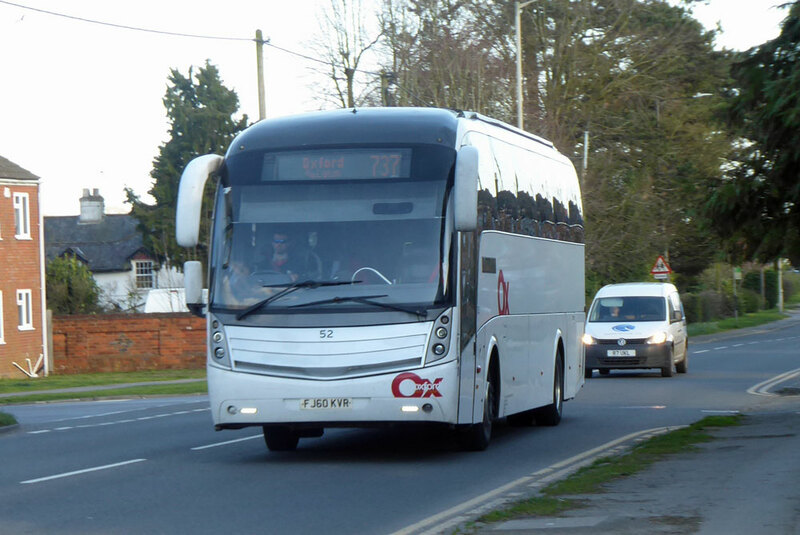 Coach 52 is seen passing through Stokenchurch with a 737 working to Oxford on March 24th by Gavin Francis. Graham Low writes "Both 969 (BT15KLZ) and 970 (BT66TZM) have been on the road in Iffley this morning, as well as several of 971-8, i.e. the "permanent" fully branded etc. fleet. So there are now 10 in use." Once again Gavin Francis has provided pictures of 970 seen below. It is grey with unusual branding. I am told that NINE is the total for current service. 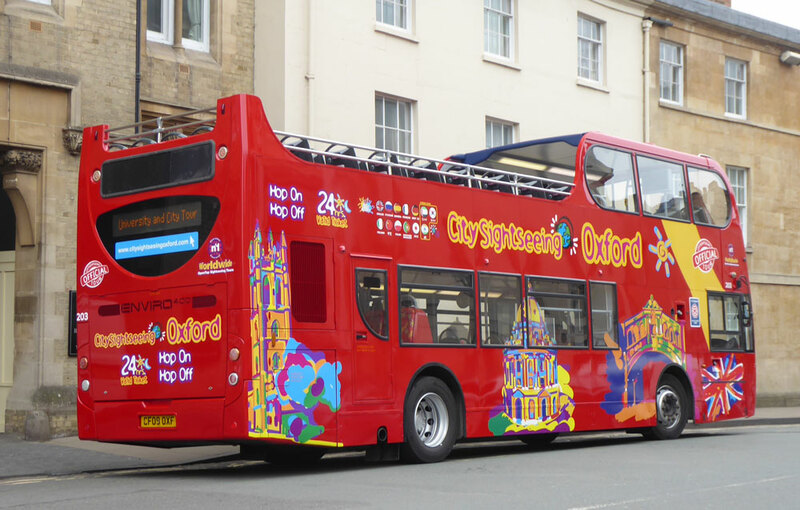 Graham Low writes "I don't think that I have read that City Sightseeing 203 CF09OXF is now in service?" 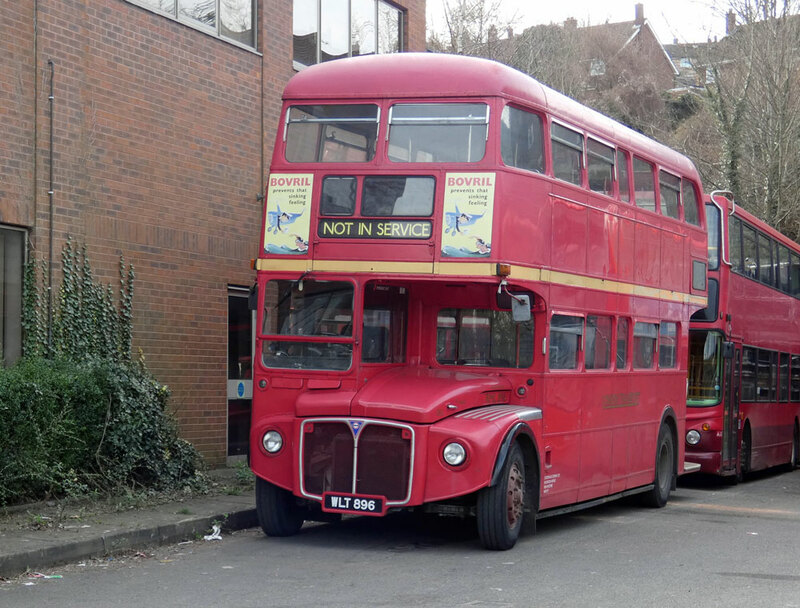 Well, Gavin Francis has provided pictures to prove it and here it is below, as yet not re-registered, also 204 is still in service in Oxford by Jim Wright. Pictured on March 20th by Gavin Francis. By Sunday 24th, this bus had been reregistered SNZ1103. On the same day Jim Wright caught 204 still in normal service. Seems that 202 was running with an engineer on the A34 when seen - March 19th by Derek Dawson. No reports or pictures for this issue. 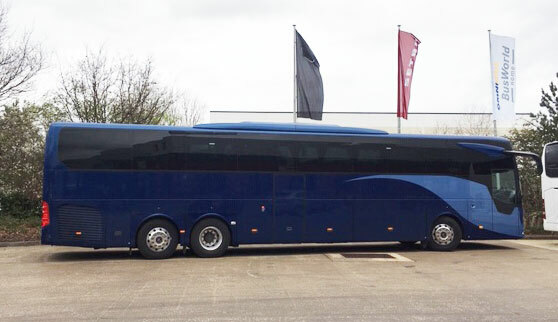 New Scania/Caetano 56 seater 280 BV19XOM is seen with an A7 working by VCS on March 24th by Gavin Francis. Volvo/Caetano of Oxford as their 57 is seen with a 737 service heading for Oxford on March 23rd by Malcolm Crowe. 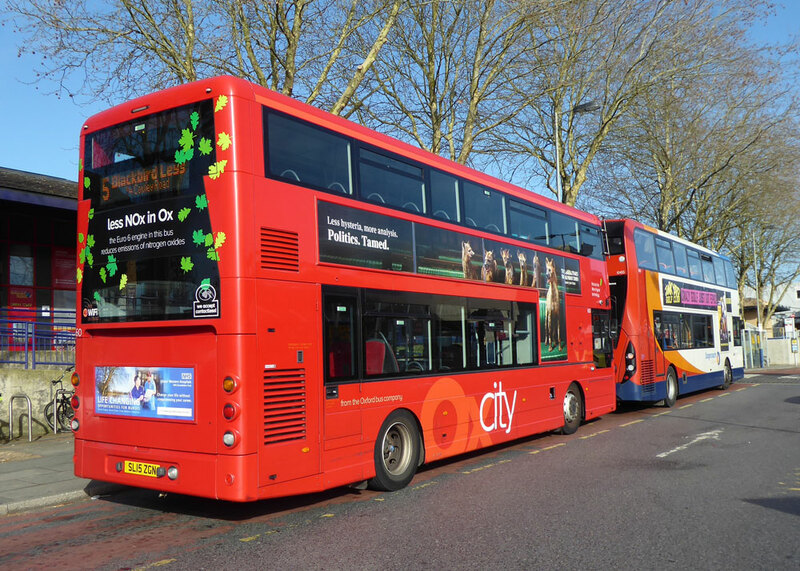 In use by Weavaway, Caetano 1411 X70 OXF is seen leaving VCS by Gavin Francis on March 24th. Skills BD65JFG with a new super rear on March 23rd by Gavin Francis. 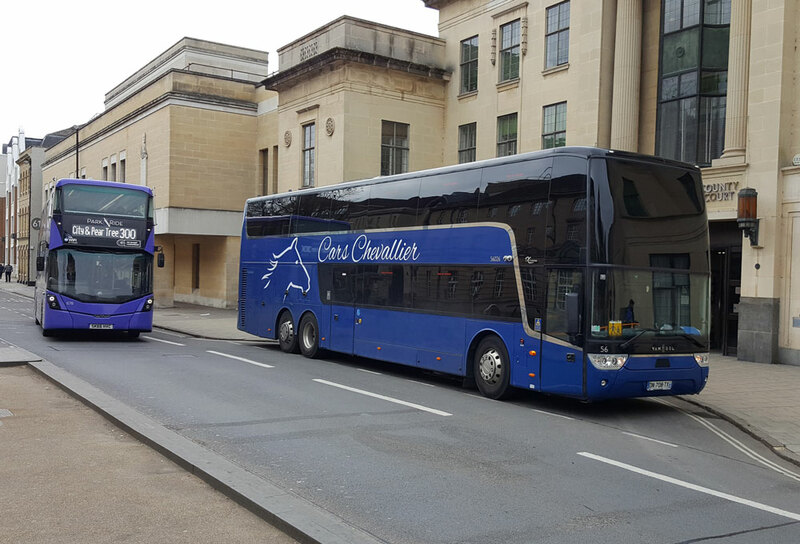 Volvo/Van Hool BIG2115 with the 853 in Oxford on March 23rd by Gavin Francis. 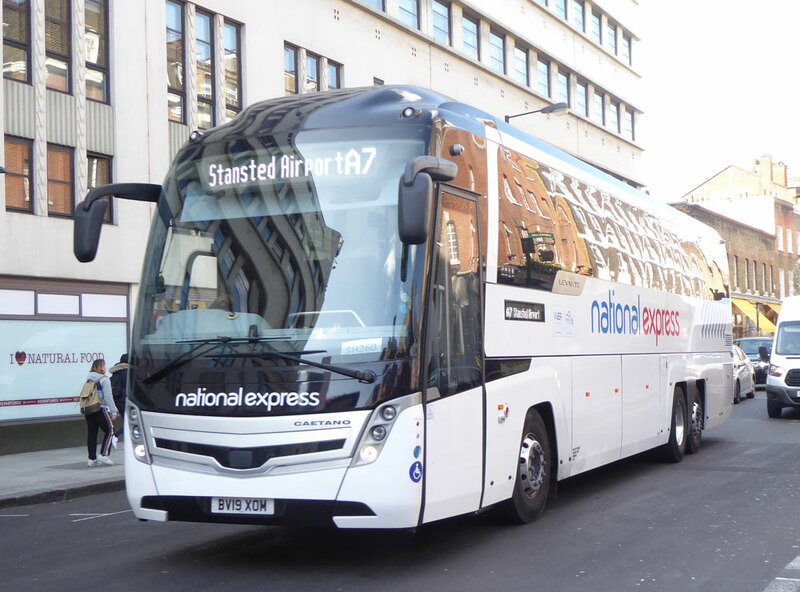 Seemingly very quiet at present but one question arises from looking at last weeks link from Richard Sharman - https://bustimes.org/vehicles - why is it that, in spite of Stagecoach Perth, Fife, Midlands, East, South and South West to mention a few, Stagecoach in Oxfordshire does not subscribe. 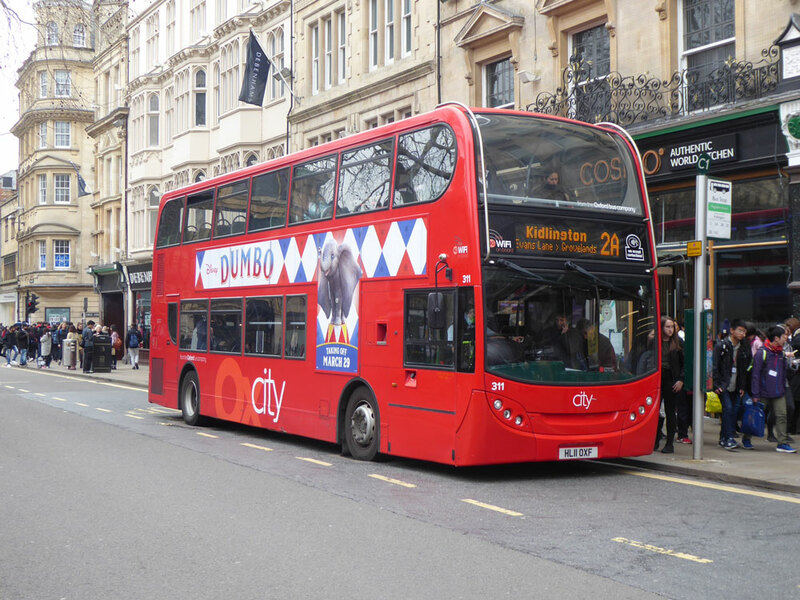 I find this strange as it means that members of the public looking for their bus on a joint Oxford route or worse still will only see the Oxford Bus Company, this seeming against best marketing principals? Do refer to the link to see what I mean. 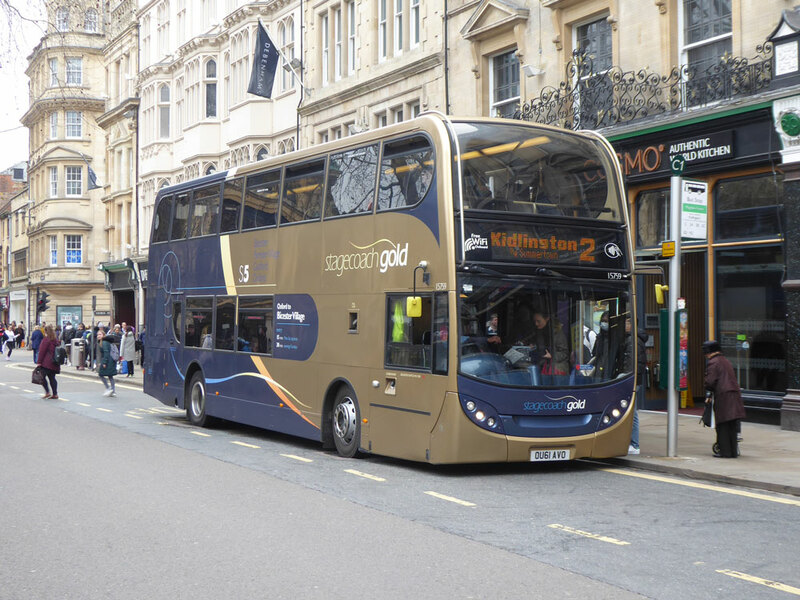 MMC 10678 works on Gold route S5 in Oxford on March 20th by Gavin Francis. 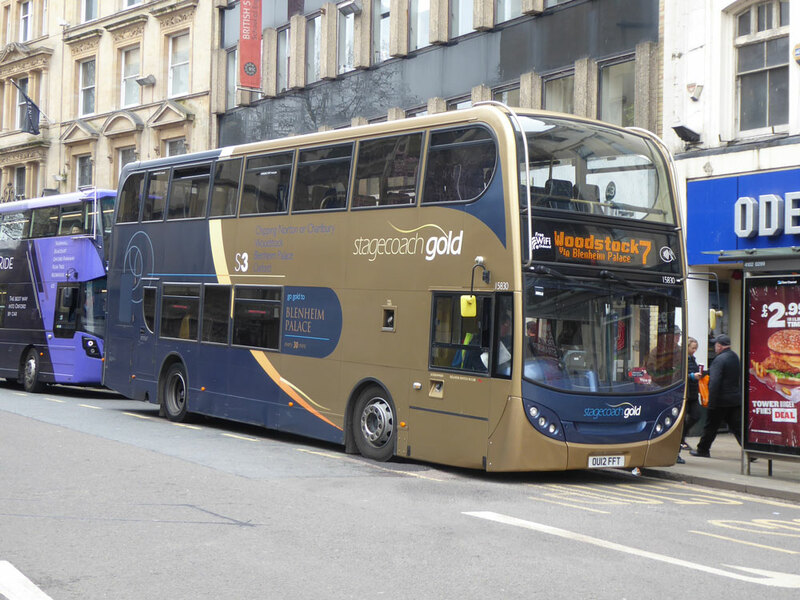 Gold S5 branded 15759 is seen with a 2 on March 20th by Gavin Francis. Some of the 7 services are worked by Chipping Norton outstation hence a Gold 15830 working this route on March 20th by Gavin Francis. 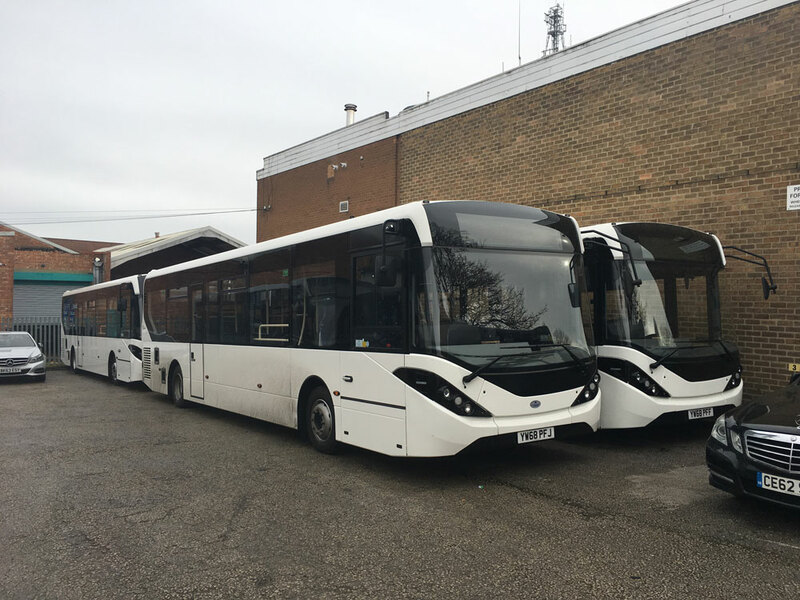 At least two Scania/Enviro 400s have now transferred here from West 15637/41 were parked up at Bedford depot on Friday, March 22nd. 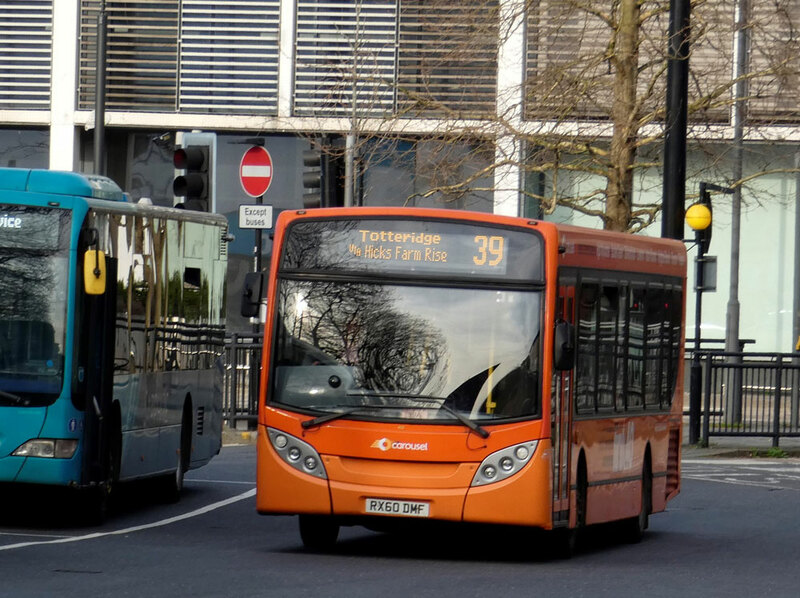 Now here from Stagecoach London are 9.4m single door ADL Enviro 200s 36301/02. They are being repainted and prepared for service at Bedford. Once they are in service training Dart SLFs 34421/22 will return to Peterborough and Cambridge. 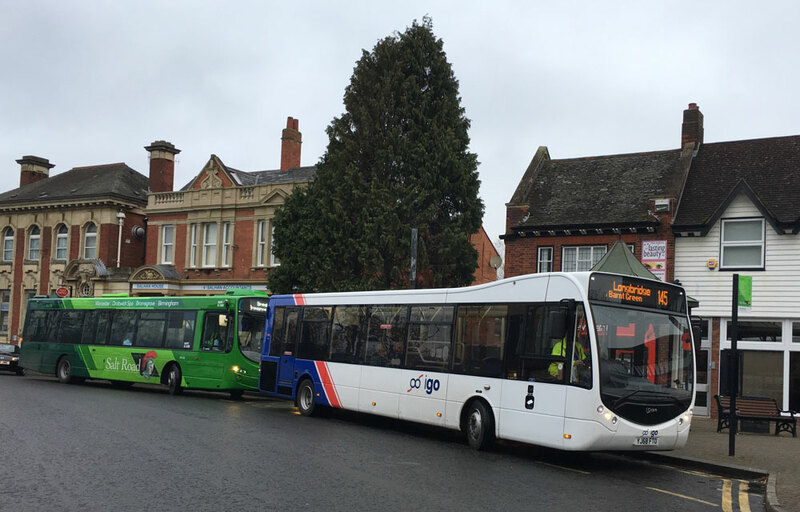 Now sold are former Norfolk Green Tempos 25123/27/28/29/30/31, whilst surplus Optare Solos 47351/52 are being transferred to South Wales. 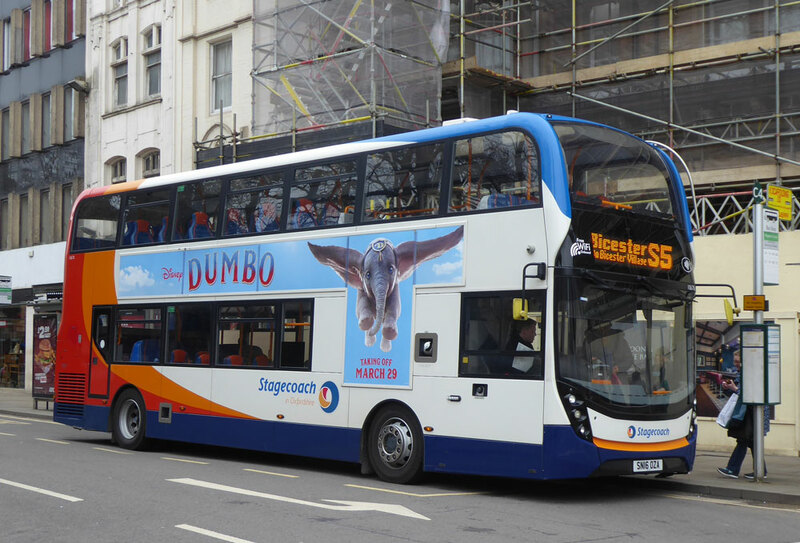 Look out for six Scania/Enviro 400s being transferred to this fleet from Stagecoach West. We understand these will be 15637/39/40/41/42/43. 15638 is not included as it carries the Stagecoach West 25th Anniversary livery and branding. Gary Seamarks writes "Latest on X5 "
54302 is at present VOR, not tracked since March 5th, maybe the one visible on the pits. 54313 is another VOR was recovered from near Cambourne on Saturday evening, March 16th, with a blown engine. Panther 53612 has been VOR for quite a while but seems to have reappeared. The X5 had a diversion on at least Monday/Tuesday, March 18th & 19th, between 09.00 and 16.00 as A422 was closed at Chichley, and the diversion was via the A421 to almost J13 (instead of crossing at J14) then up into Milton Keynes via the A421/A4146. 54314 with an X5 is on Monday with the 14.30 to Oxford at Great Denham on diversion. Three deckers recorded on X5 today as well as a couple yesterday. One from March 23rd ex Norfolk Green, 48035 at Great Denham on Town route 8. 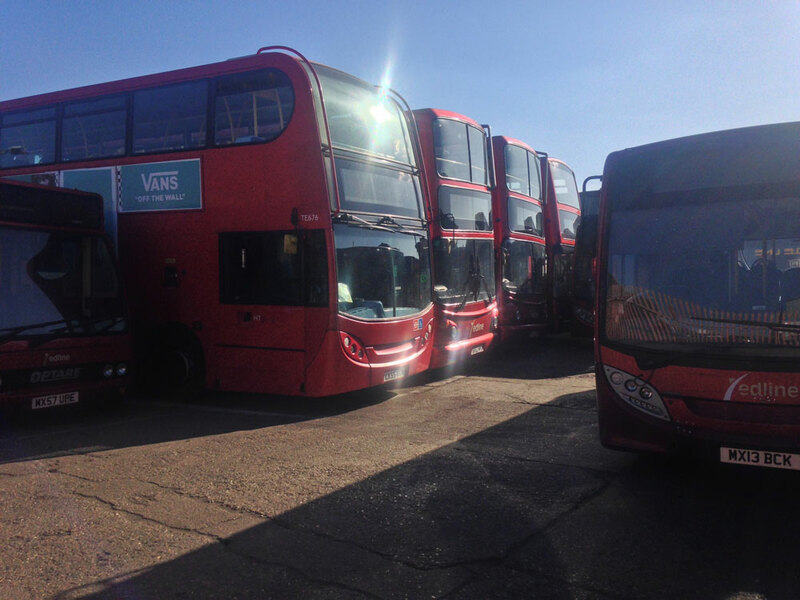 Four Reserve Fleet Dart SLFs are now parked up at Northampton depot. 34815/16 and 35174/75 had previously been based at Rugby. 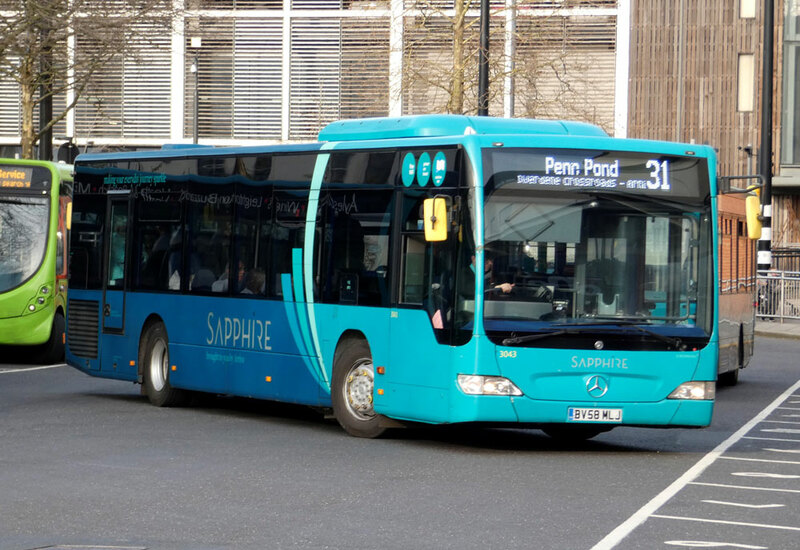 Also reserve fleet Dart SLF has been moved from Rugby to Northampton being 34817. 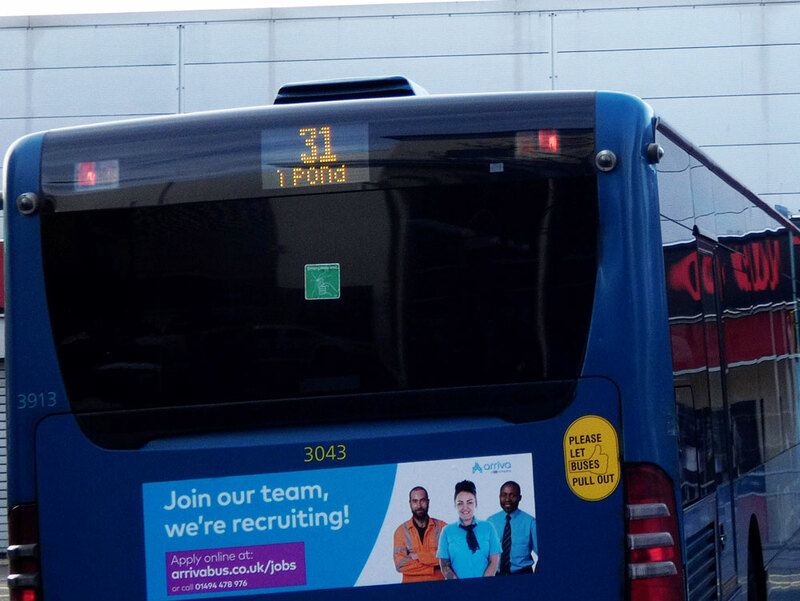 Marcus Lapthorn writes "I saw Stagecoach West’s 15532 in Swindon bus station this afternoon. 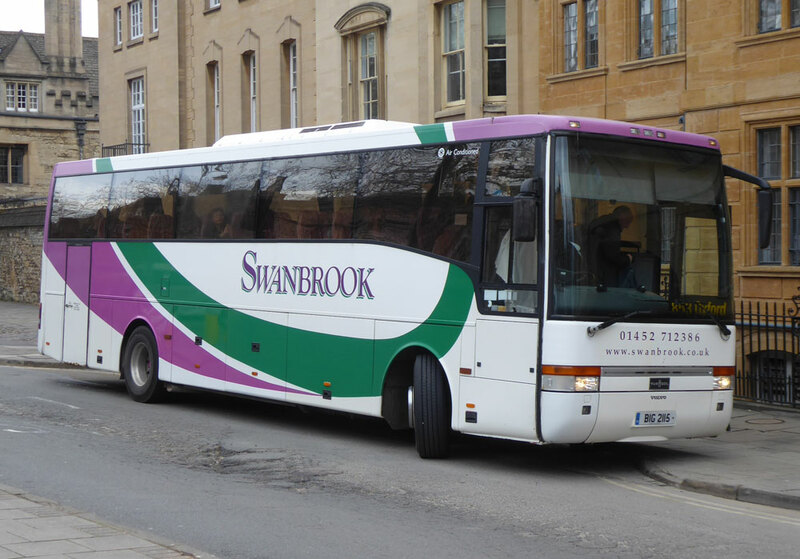 This Scania/Enviro 400 Gold d/d is allocated to Stroud according to the latest fleet handbook, so maybe on loan to Swindon?" Certainly checking the March allocation lists Marcus is correct that 15532 is allocated to Stroud. 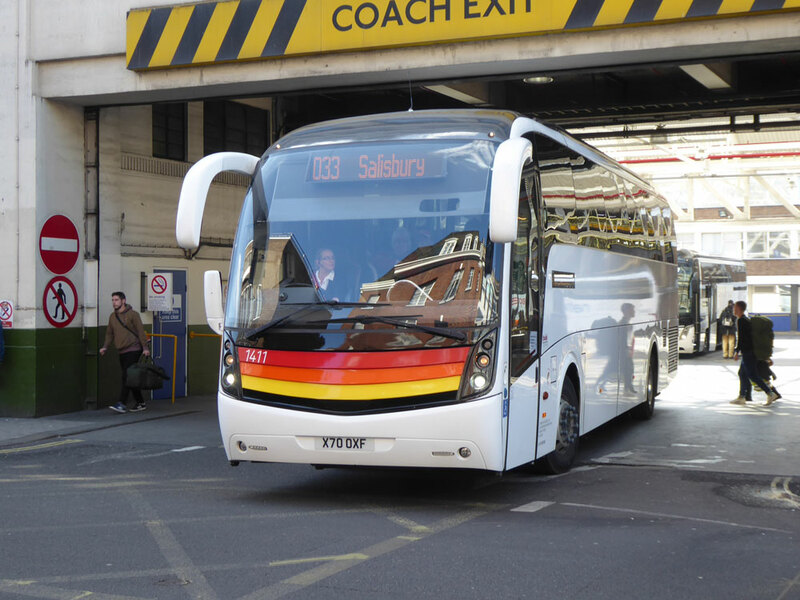 Another report advises that besides the transfer of the six Scania/Enviro 400s to East, we also understand that 15450/51 and 15636 are being transferred to Stagecoach South East at Eastbourne. This could explain the arrival of 15532 in Swindon? 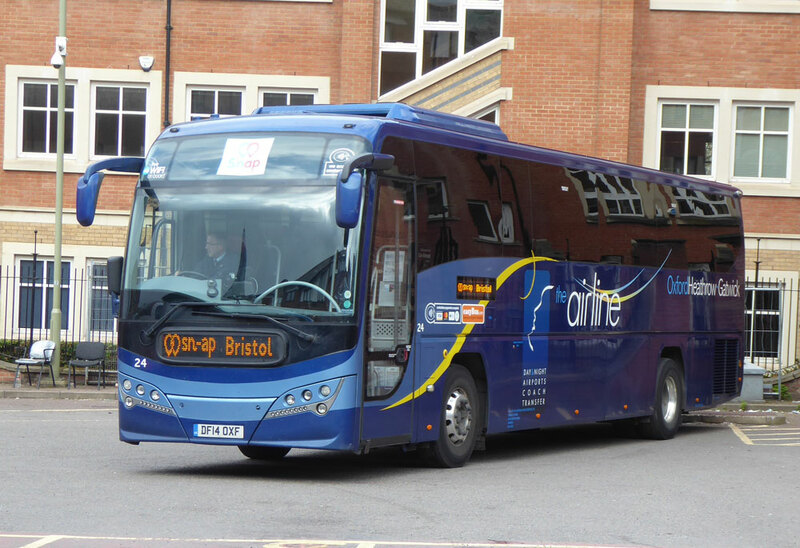 Jim Wright advises that an "Old left hand drive Megabus Europe in Oxford today, it still in blue with old fleet number 56026 still carried on rear. 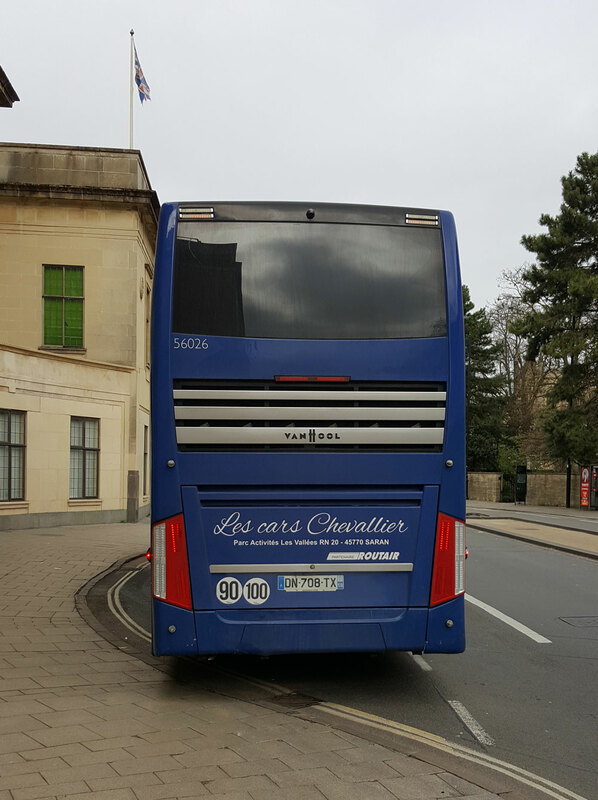 It's now French owned by Les Cars Chevallier details on rear. reg.DN708TX." Seen by Oxford Crown Courts. 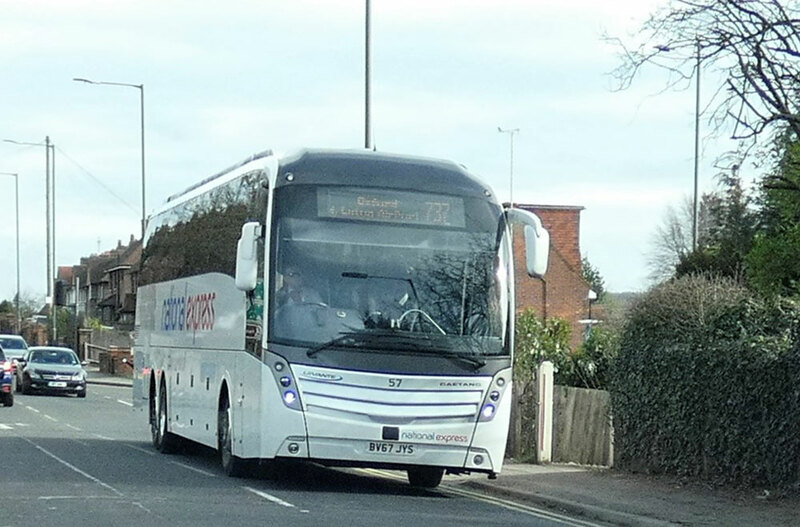 South Gloucester Bus & Coach has confirmed that SG27 is Stagecoach Megabus 55028. 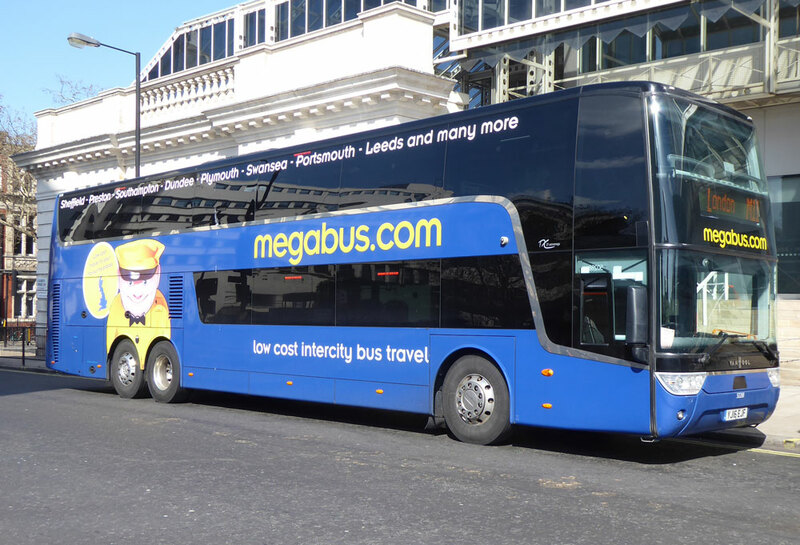 This means that SG28-32 are Megabus 55023-27 in order. 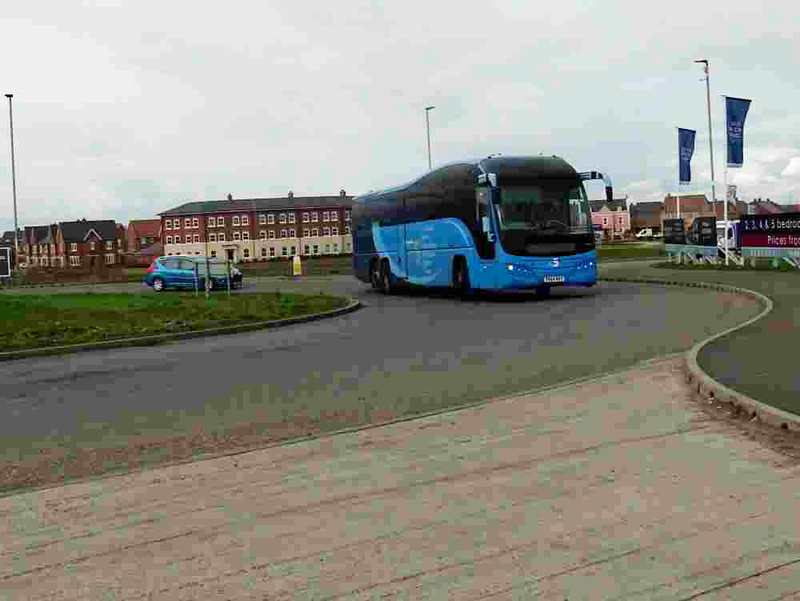 Megabus 50288 working the M11 parked on Elizabeth Bridge, the date March 24th by Gavin Francis. 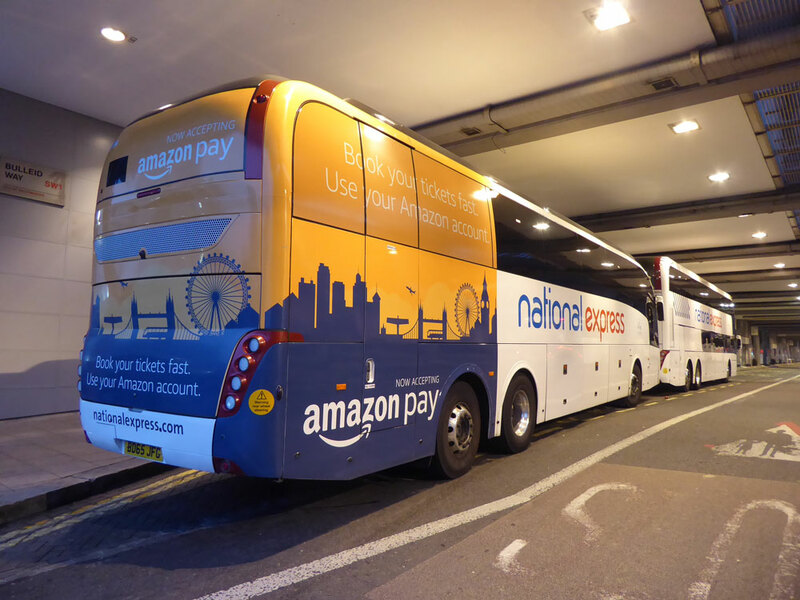 Matt Bullock writes "A photo for you for the OCBP - Blowfield (Walters) of Forest Hill have acquired two Neoplan Tourliner coaches from Pride of the Clyde, Greenock." 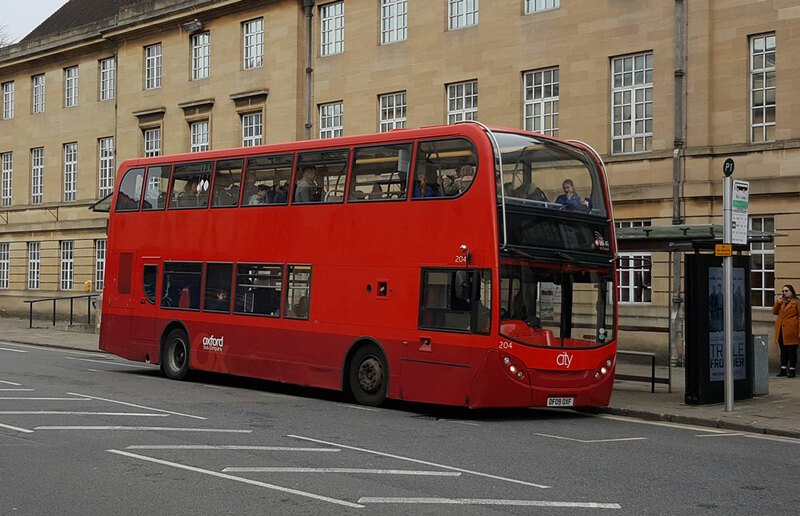 The pair are OU17OTS and OU17OTT, seen together in St Giles, Oxford by Matt Bullock on March 20th. Imperial Coaches (Colnbrook) A2VXH Formerly G641CHF new to North Western in Warrington as 641 a Volvo B10M-50 with East Lancs H49/39F bodywork delivered November 1989. Picture by Gavin Francis on March 22nd. Nearly 30 years old!!! RM357 at Binders Yard near Wycombe on March 22nd by Gavin Francis. 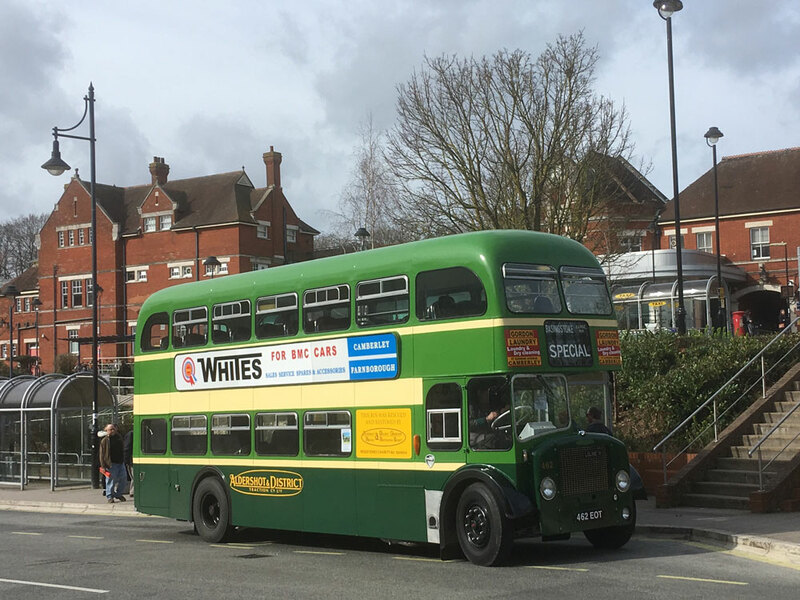 ALDERSHOT & DISTRICT's Dennis Loline III nr 462 in BASINGSTOKE on March 9th by David Allen. 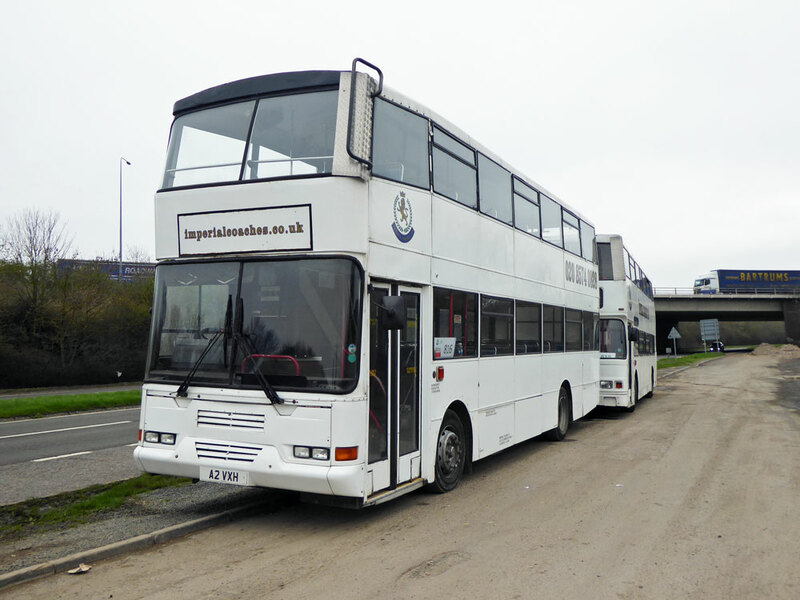 RML896 seen in the overflow parking area at Carousel on March 23rd by Malcolm Crowe.